It’s late, well past my bedtime, but today has been so special that I wanted to record it here. Nothing big happened but it was beautiful none the less. 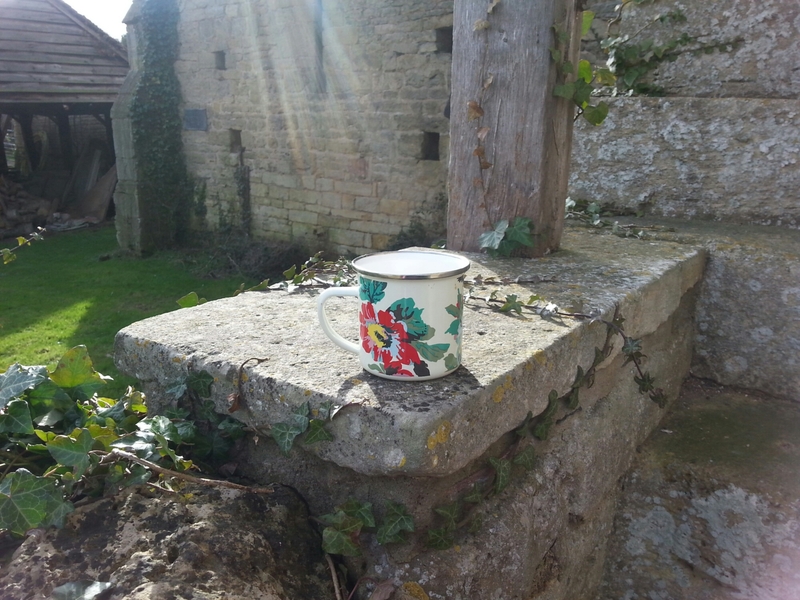 There was some unexpected sunshine as I enjoyed a cup of tea at an old barn (Bredon, in this case). Any meal tastes better with a healthy dose of fresh air! A Happy New Year to you all! 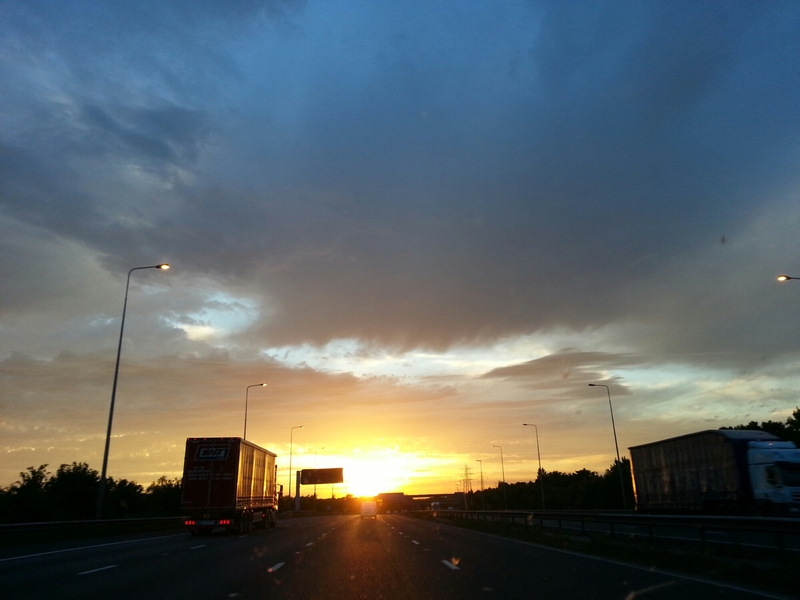 As has become my habit, it’s a time for starting over which finds me returning to this blog to say hello once again. This last year has brought about big changes in our life but, in another way, returning here reminds me how things are just the same. 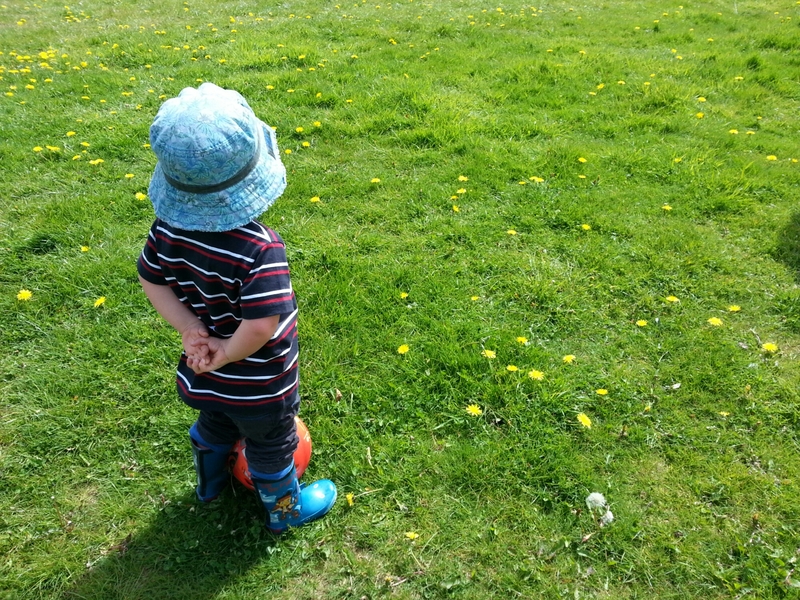 I am now back at work and we no longer have a tiny baby and a toddler but a girl who is already beyond the toddling stage, zipping about the place desperately trying to keep up with her brother, and a growing boy wise beyond his years. 2015 also saw major upheavals with a house move, including a few months squatting at my wonderful parents’ home in between, as well a new addition in the shape of my adorable niece. Only 6 weeks older than my Little Lady she has settled beautifully in our family and our hearts and we could not be happier about it. Everything’s changed and nothing has. 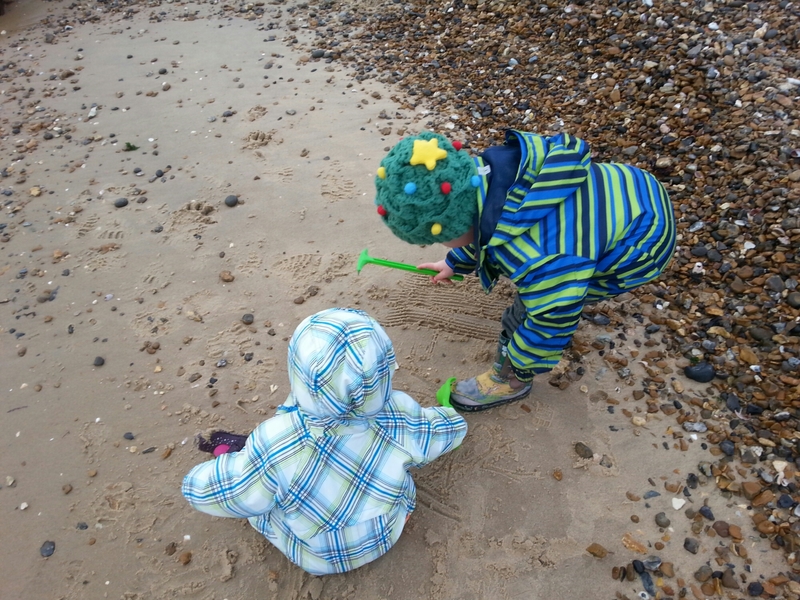 New additions, new surroundings, yet here I am blogging about a winter trip to the beach. 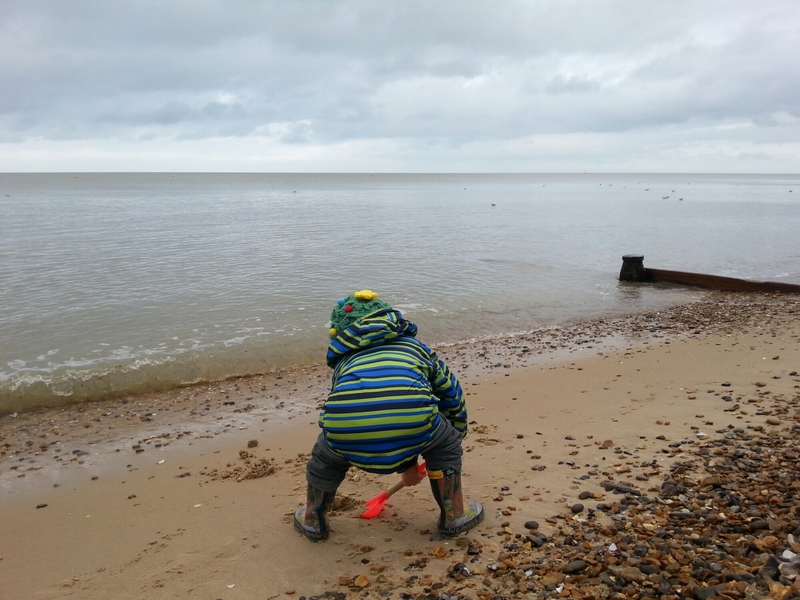 Buckets, spades, a picnic lunch and the sounds and smells of the ocean. Fabulous family time that I hope never changes. Greetings all! I hope this post finds you well. 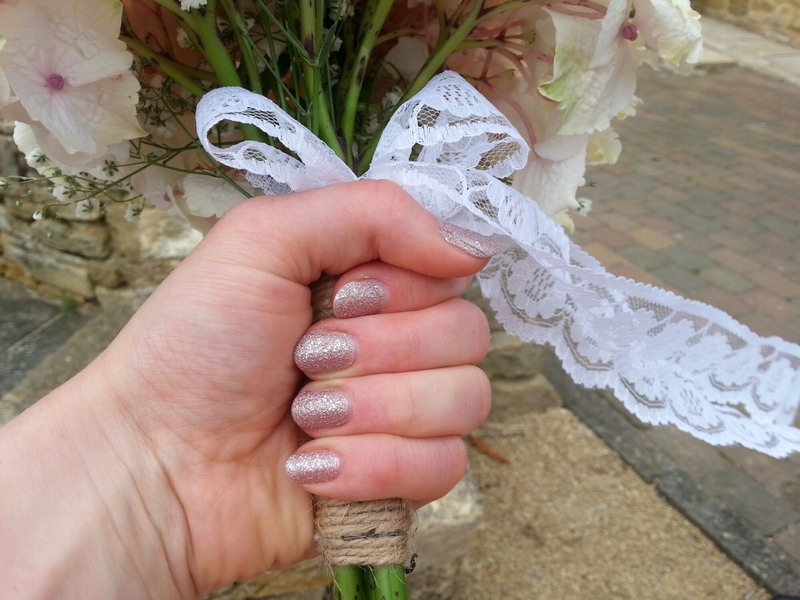 Today I’d like to share a few pictures of the beautiful wedding that I was lucky enough to attend last weekend. The bride is one of my oldest and bestest friends and I had the honour of serving as matron of honour with a speech and everything! Held at the beautiful Deer Park Hall, this was a proper fancy pants wedding and the effort that the bride and groom had put in shone through. No detail was overlooked and there were little touches everywhere that made everything a little bit more special. 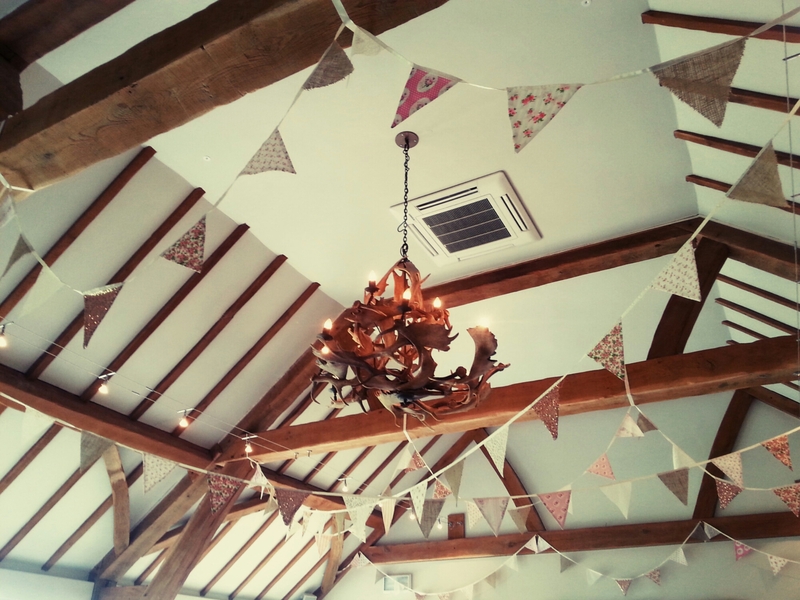 (See the bunting in the top photo? Endless streams of pretty triangles all cut, sewn and ironed by the groom. Spectacular!). The Little Man did his bit well, dressing up and posing like a star all day as well as making this rather special heart for the bride, complete with buttons and sparkles. 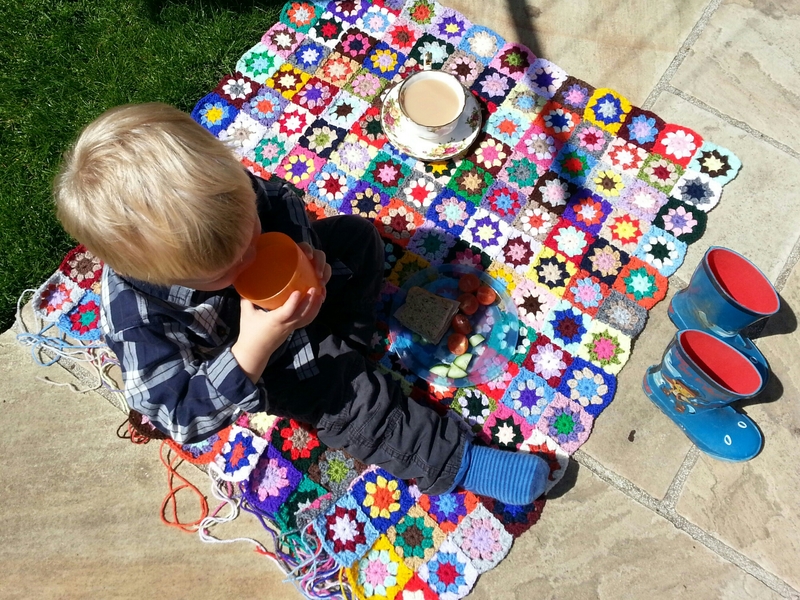 He’s really got into his crafting at the moment and I am loving it! 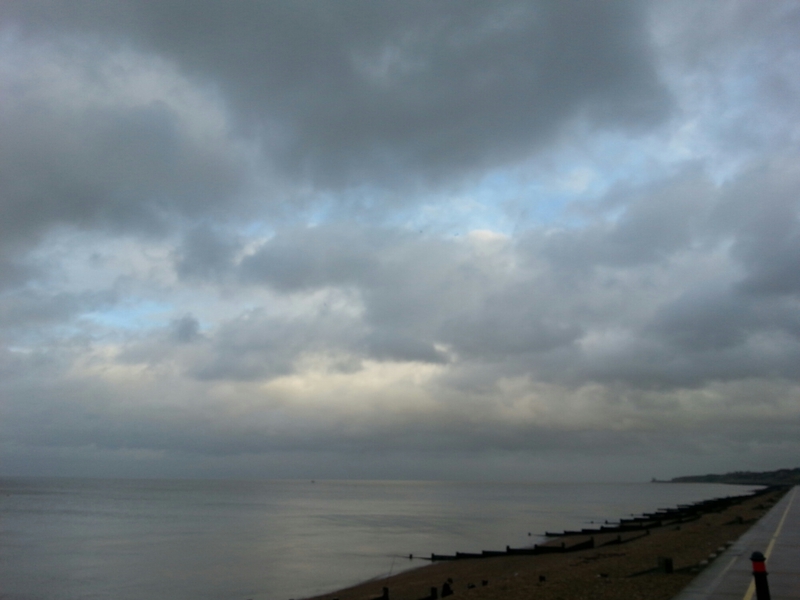 The weather was a mixed bag but warm and generally kind, giving us plenty of time to enjoy the stunning views. 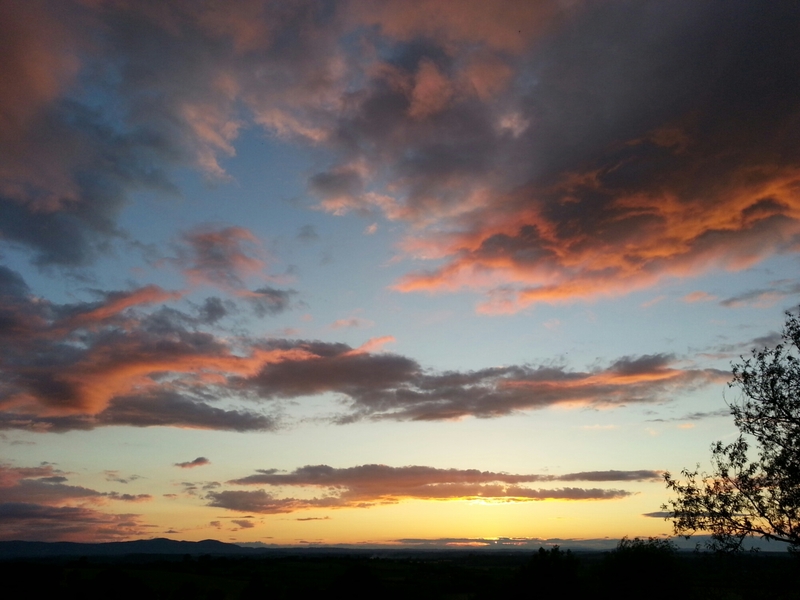 The sunset was spectacular, even if I did manage to miss taking a proper photo as hubby’s phone chose precisely that moment to die. 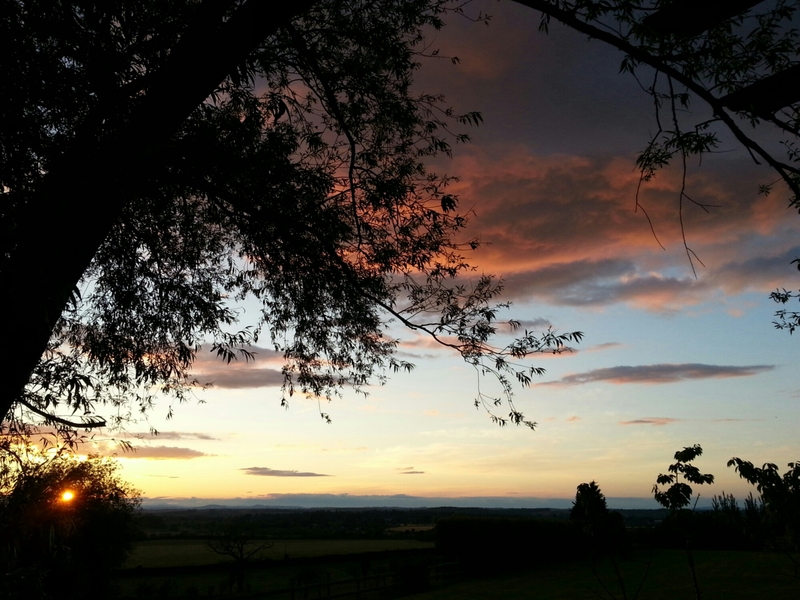 Needless to say the skies were incredible and the countryside glowed. 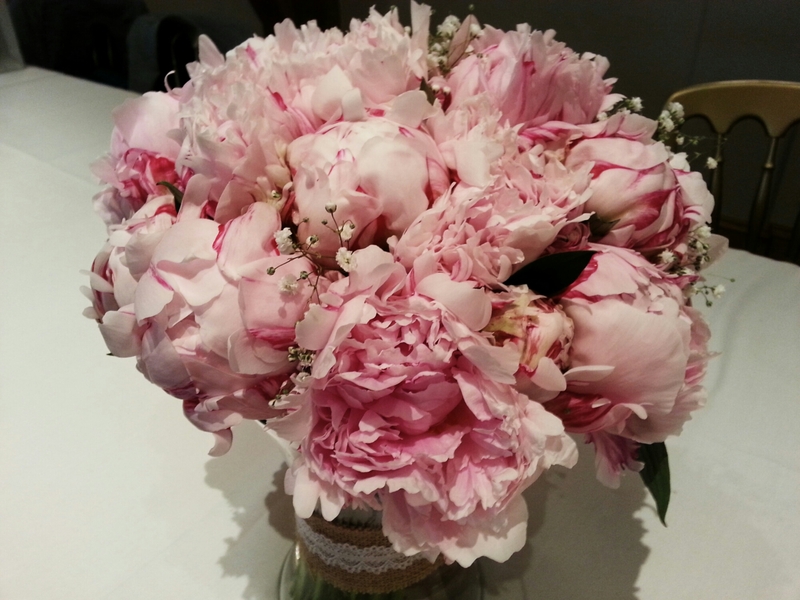 Of course, there was the star of the show (excepting the bride and all that jazz!) and that was the cake. 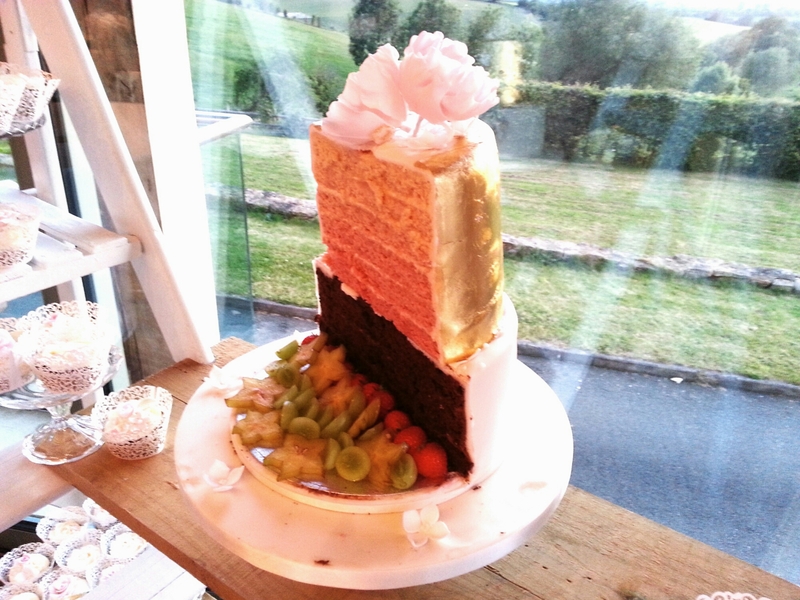 And boy did this wedding have cake! (Made by the wonderful Marie Green). 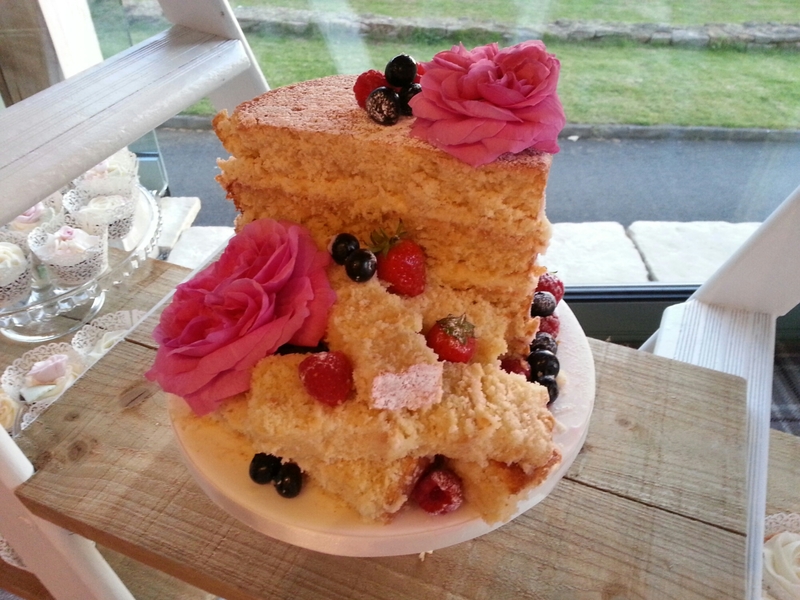 Cut it open and it was a rainbow of pink sponge (can a rainbow be one colour?!). You must excuse some of the photography – as I did not have a bag on me most of my snaps were stolen on hubby’s phone in between bridesmaid duties and childcare. It was really strange not having the time to take a few candid shots whenever I wanted and, I have to say, I really missed it. 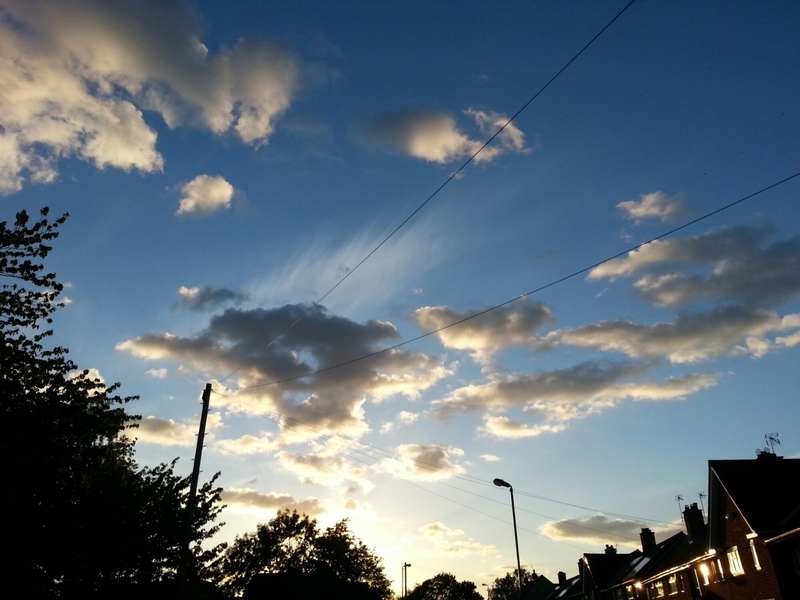 The ones I did get, however, do give a good idea of how lovely the day was and I want to record it here for memory. I hope you will indulge me! Onto cake number two and this was a ‘naked’ sponge that held a wonderful surprise when eaten – it was coconut and totally delicious! The flowers used for decoration in the evening were from the two mothers’ gardens, which I thought added a lovely, personal touch. 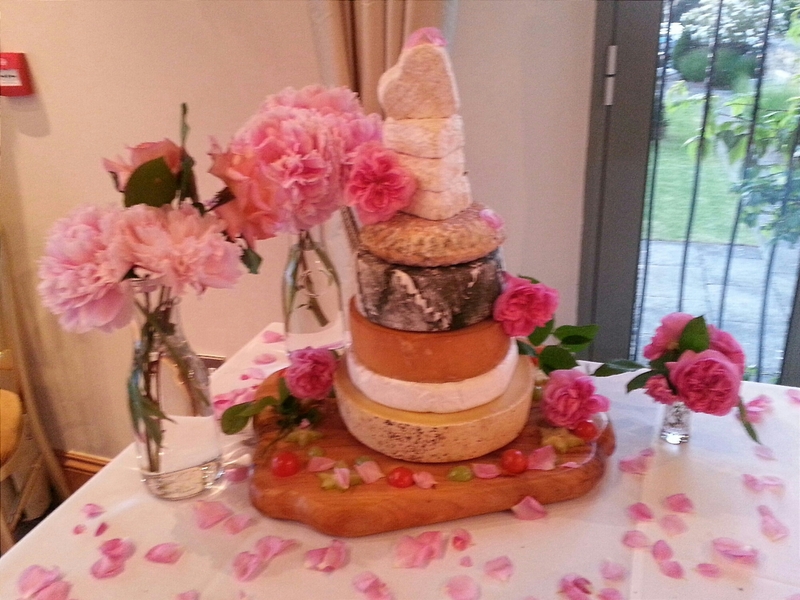 Moving onto number three and we have the evening buffet – the cake of cheese from Ansteys. Nom! We had one of these at our own wedding (note our board underneath!) and they always go down well. Not to mention the fact that, when the celebrations are over, it is nice to know that your wedding can still feed you in the weeks to come! And finally, at number four, we have my favourite – the cupcakes. Coming in vanilla, carrot and chocolate orange flavours these were scrumptious! Strictly speaking these are more fairy cakes as the were small and made out of light, fluffy sponge instead of cupcake batter. Either way, they were both delicious and adorable. 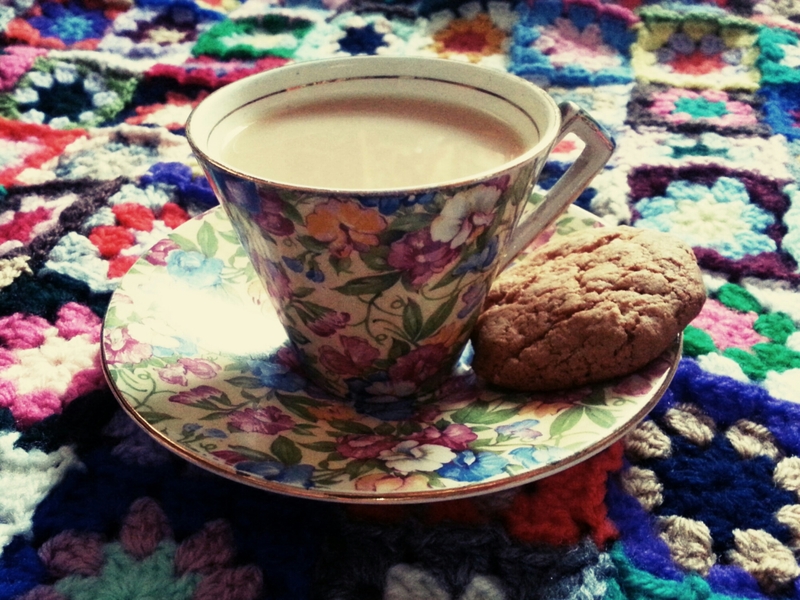 We were lucky enough to be gifted a few to bring home so they have been providing a sweet treat of an evening with a cup of tea and some crochet. Perfect! Hello my dears! 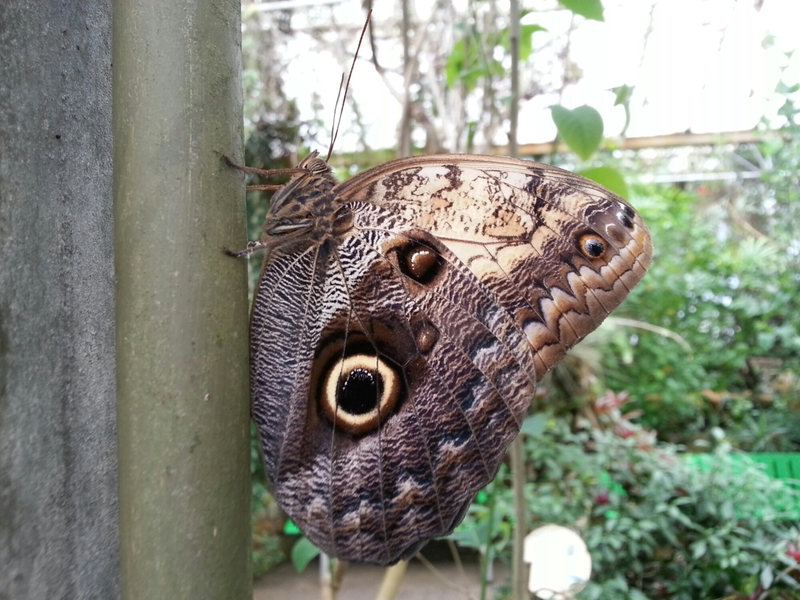 This post is somewhat late but I did promise you some photos from our trip to Edinburgh Butterfly and Insect World so here goes! 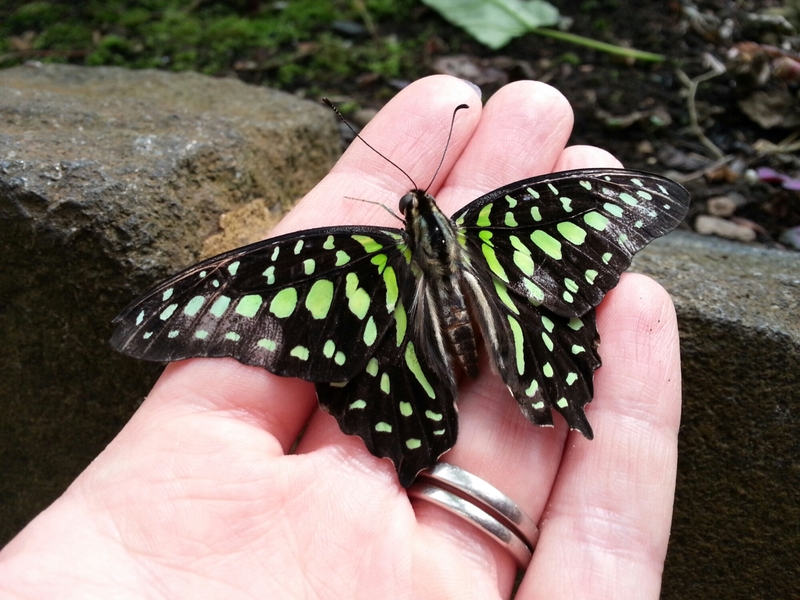 There is something magical about these beautiful creatures and I love having the opportunity to be so close to them. 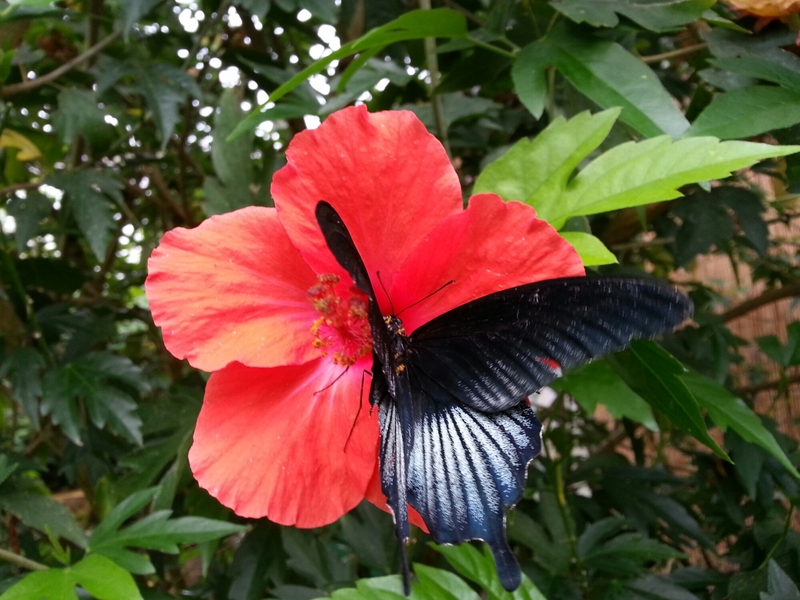 And the flora was equally dazzling with tropical blooms all around. 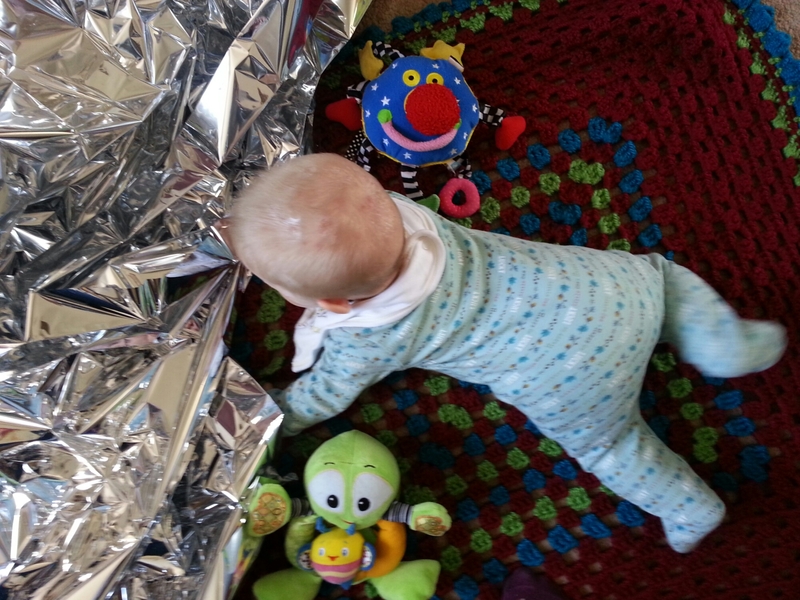 The staff were wonderful, eager to share their knowledge and get the little people involved. 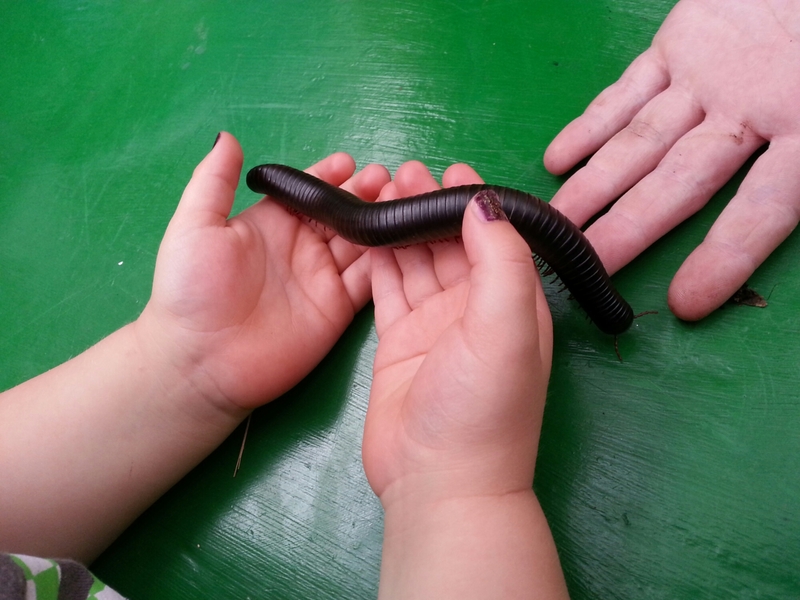 They also had minibeast and reptile handling, which the Little Man loved! 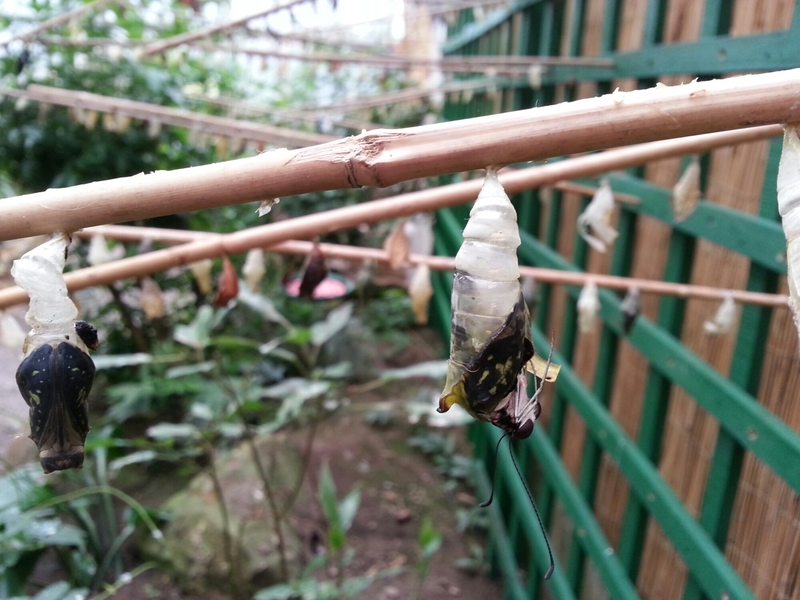 My favourite thing was that you could literally stand and watch the birth of a new butterfly emerging from its chrysalis (truly awe inspiring). And, of course, when I stood still long enough then I was lucky enough to get up really close and personal. Love it! And do you want to know the very best thing about this place? 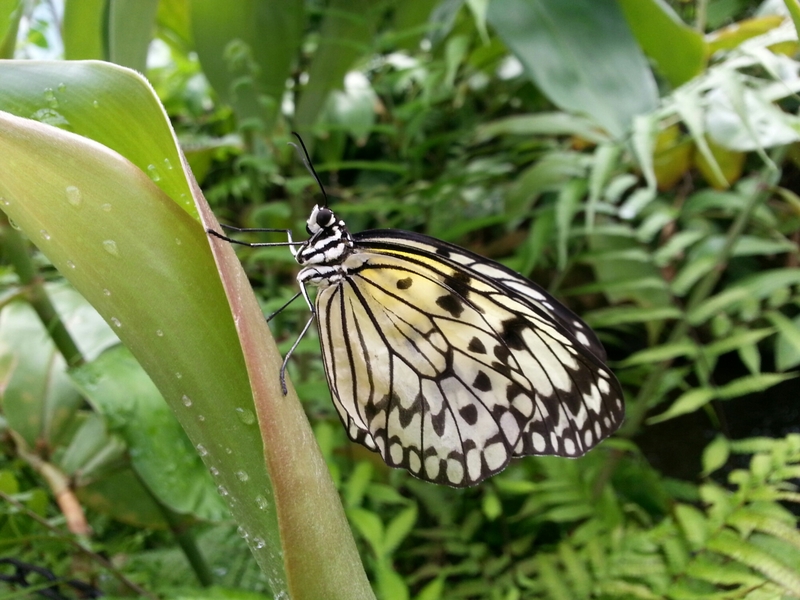 The Butterfly World is situated on the same site as Dobbie’s Garden Centre so you can take a break and get some sustenance before returning to the green house. How good is that?! (Oh, and expect to see my attempt to recreate this coffee delight sometime in the not too distant future!). 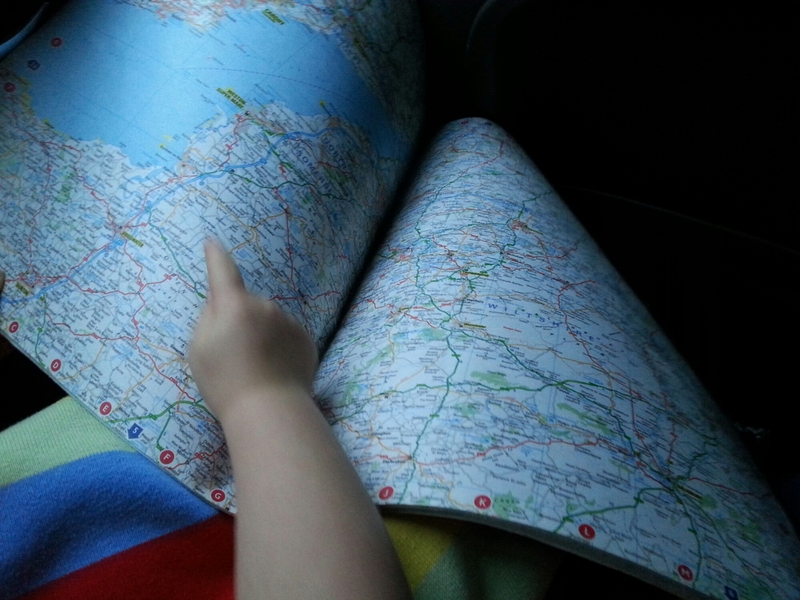 Last Thursday the opportunity arose for us to pack our bags, bundle the kids in and head north for a weekend with my father in law. I love Edinburgh. So grand yet so comfortable. Castles, mountains, culture, food. It has it all. What I had never appreciated before was how much amazing coastline there is within a short drive. 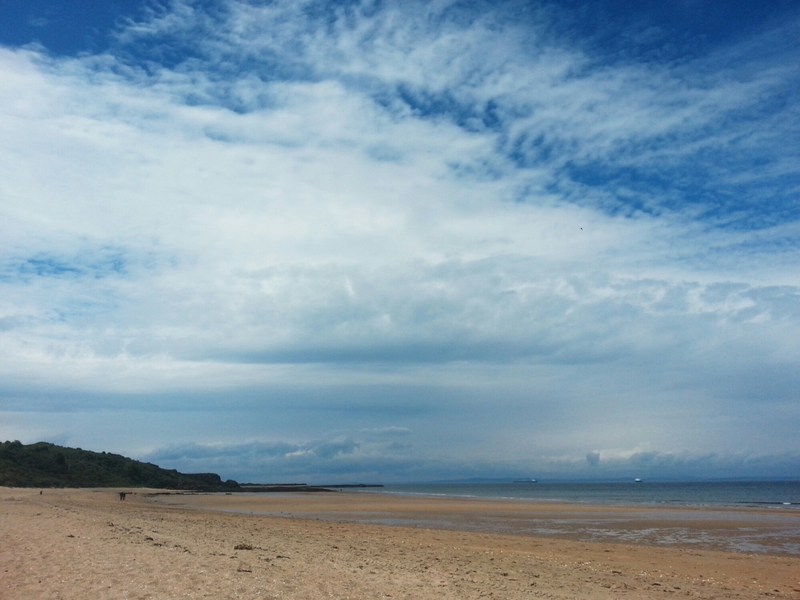 This is Gullane beach and was a complete revelation. 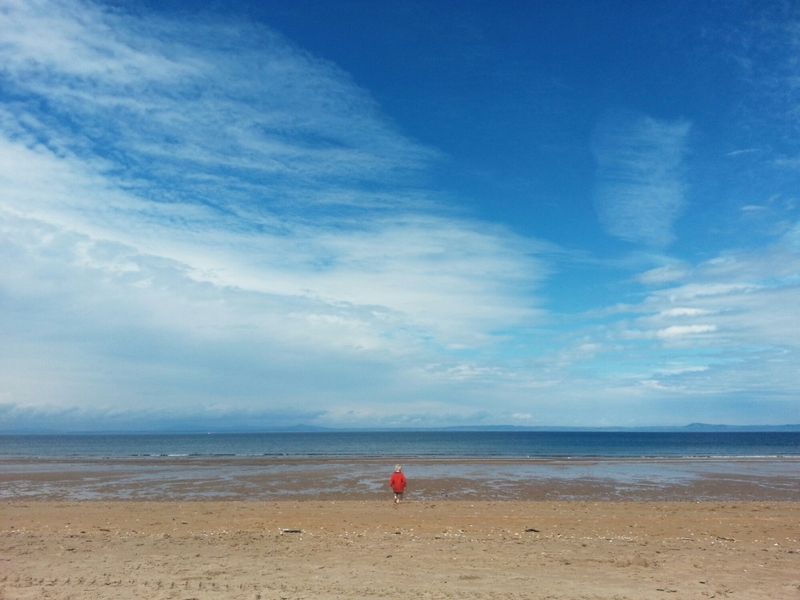 Wide stretches of clean, sandy beach with rock pools full of things to discover. 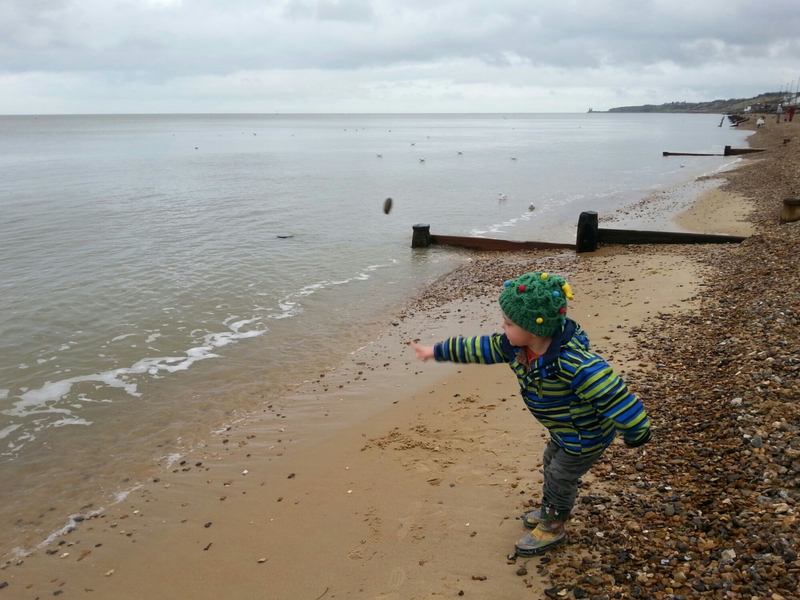 The Little Man was in his element covering vast distances as he walked back and forward from our camp down to the water to drop a pebble into the sea. 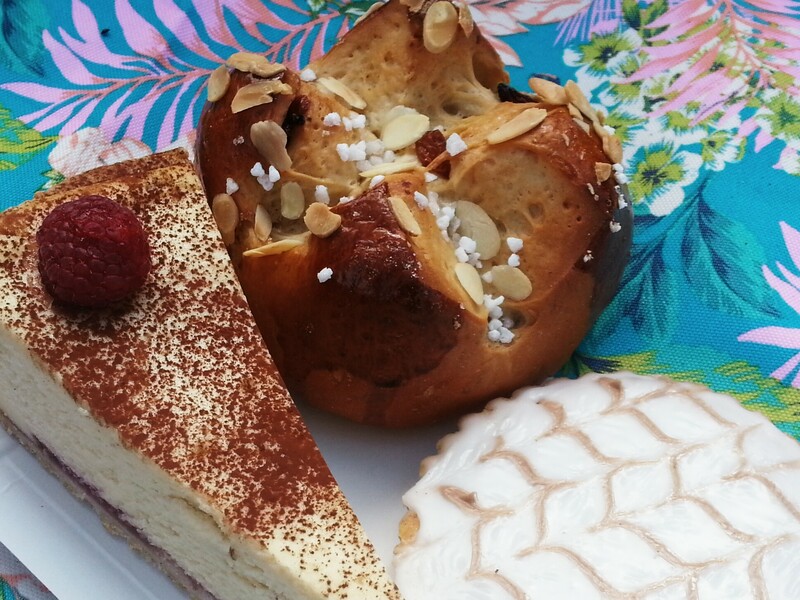 Unusually for us we indulged in a selection of bought treats from Gullane’s little treasure, the German Bakery Falko Konditormeister courtesy of my lovely father-in-law. The Little Man and I shared the raisin brioche bun above whilst hubby had a rather fancy continental sandwich. For afters we shared raspberry and white chocolate cheesecake and bakewell frangipane. So good! 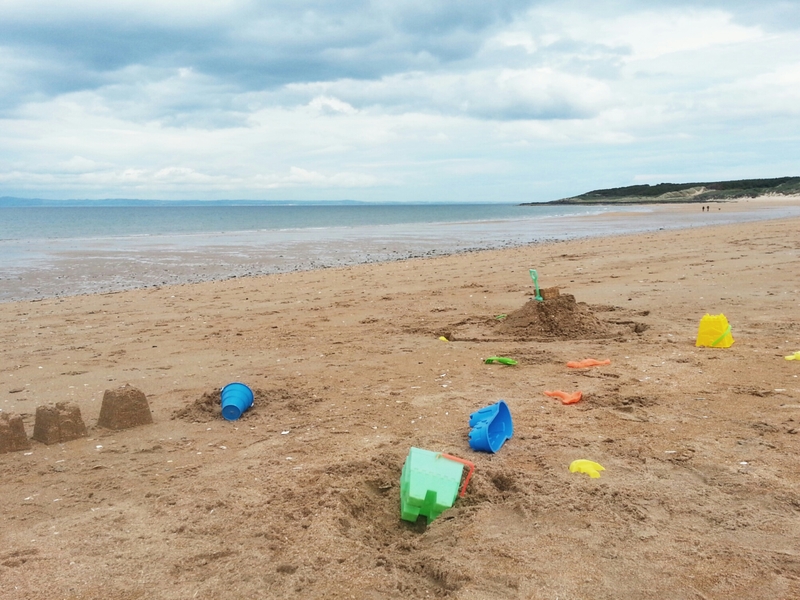 The beachy agenda was agreed before we set off from home so we remembered to pack a few trusty buckets and spades in preparation. I love the fact that many of these were used by my sister and me 25+ years for our own castle creations. Happy memories! Saturday saw us head indoors to escape the howling gales but Sunday saw the sun come out to play so we once again headed to the coast. 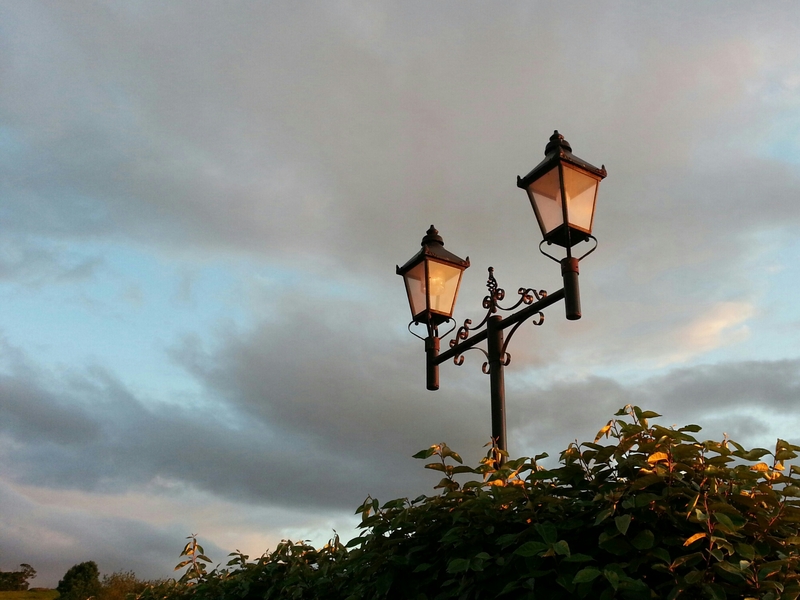 This time we were on familiar territory as we returned to a favourite haunt, Queensferry. 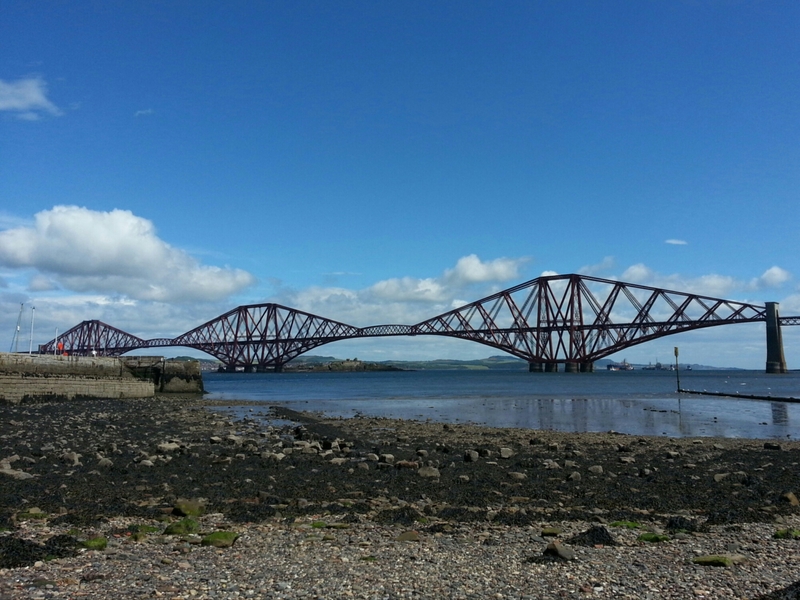 I love it here with the Forth Railway Bridge spanning the water and the boats clanking in the (permanent) breeze. 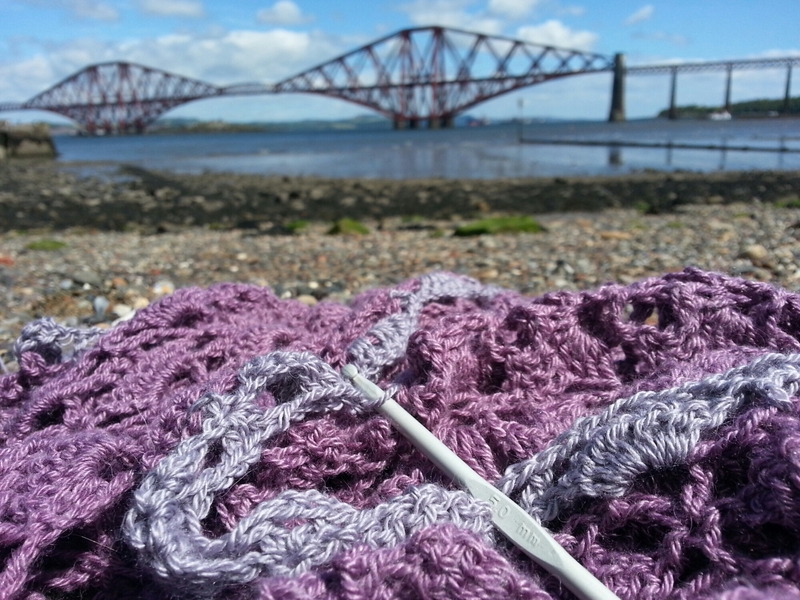 As I couldn’t safely carry the Little Lady over the slippery rocks I once more had the luxury to indulge in a bit more seaside hooky with my South Bay Shawl. Bliss! The Little Lady did come out to play as well. 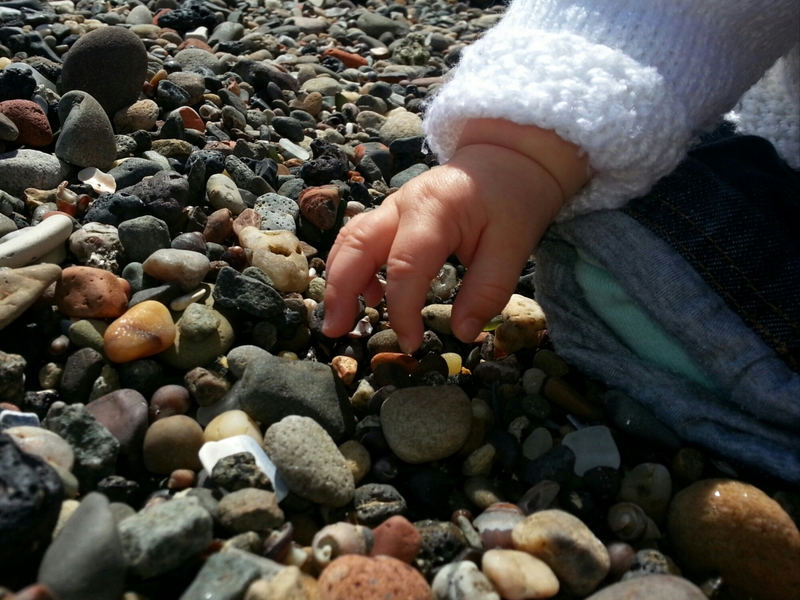 She was fascinated by the feel of the pebbles and the sound they made as she threw them. She is such a happy baby and so interested in the world around her. Everything is new and exciting when you are 6 months old! 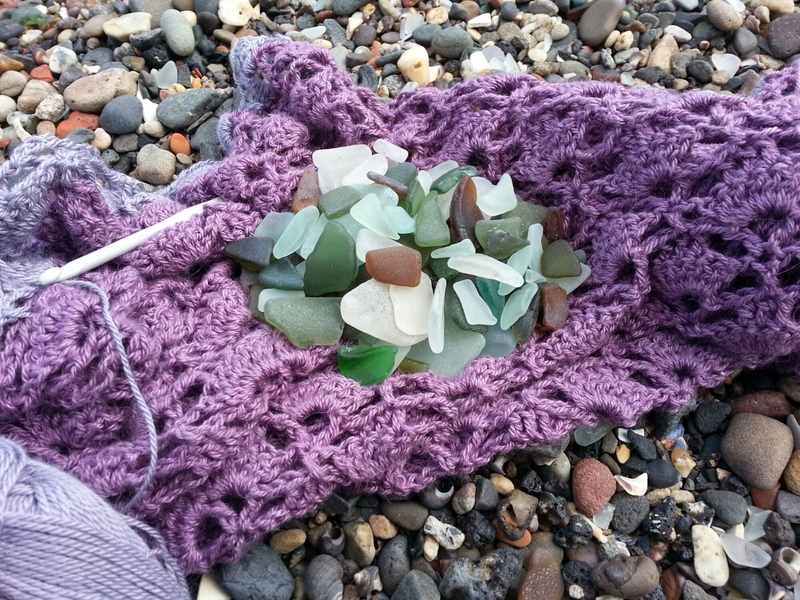 Before long I got somewhat distracted by the brightly coloured sea glass that literally littered the beach. It wasn’t long before we were all sifting through the pebbles. The Little Man was especially proud of his haul, bringing each piece to me for my approval. He favoured the larger pieces and spent the rest of the day rooting around in his pockets to rediscover his hidden treasures. Bless. 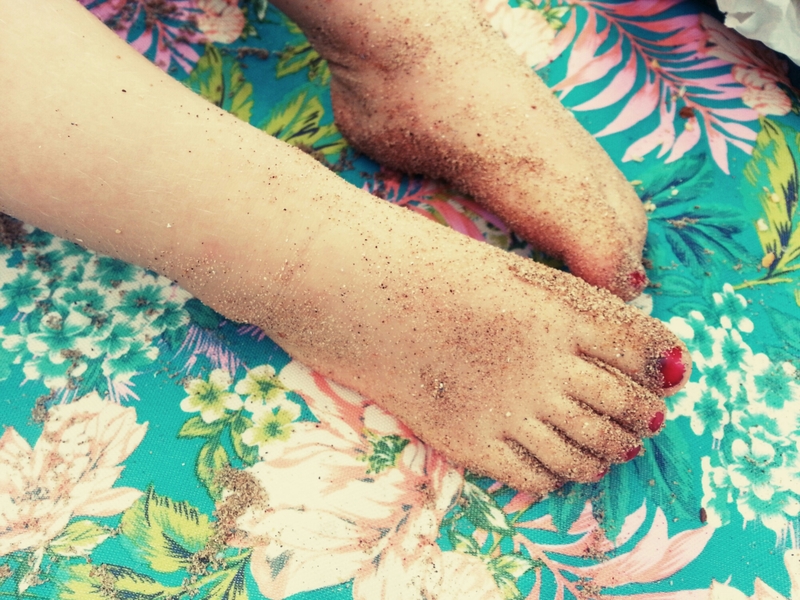 Thank you for joining us on the beaches. Next time I shall share our Saturday adventures with you. See you soon! Greetings one and all, it’s been very quiet round here lately. First I was ill then we enjoyed a marvellous weekend with family in Edinburgh so life has been busy as ever. Even though I miss it when I cannot blog I am enjoying the ease of sharing snippets of my days on Instagram. It is a great way of trying to order my ideas and stop the obsessive mental stockpiling of things that I want to share on here! As I mentioned, I was knocked sideways by a bout of sickness the other week. I am rarely ill and do not make a good patient. Having caught the bug from the Little Man I was once again overcome with respect for the stoicism that my children show when they are poorly. For me, there are two things I need when I am under the weather – cake and chocolate. 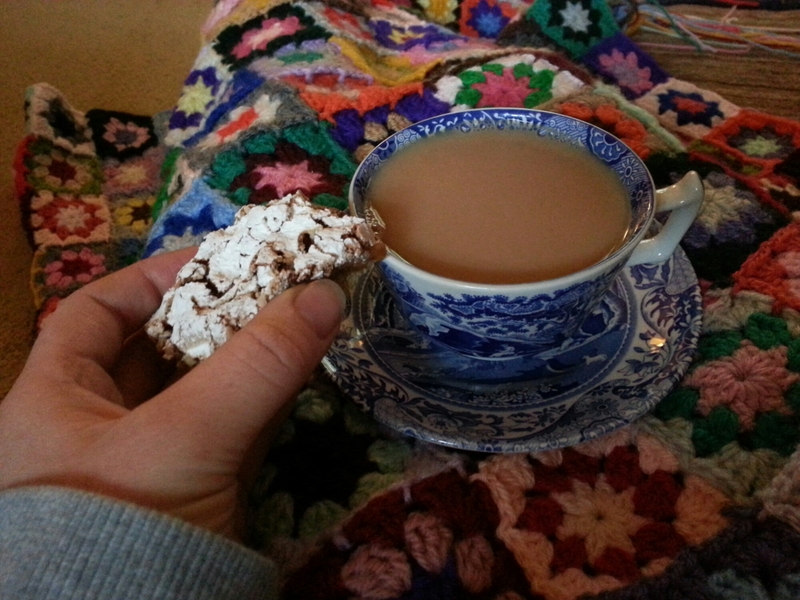 For inspiration I turned to the wonderful Lillian’s Cupboard. 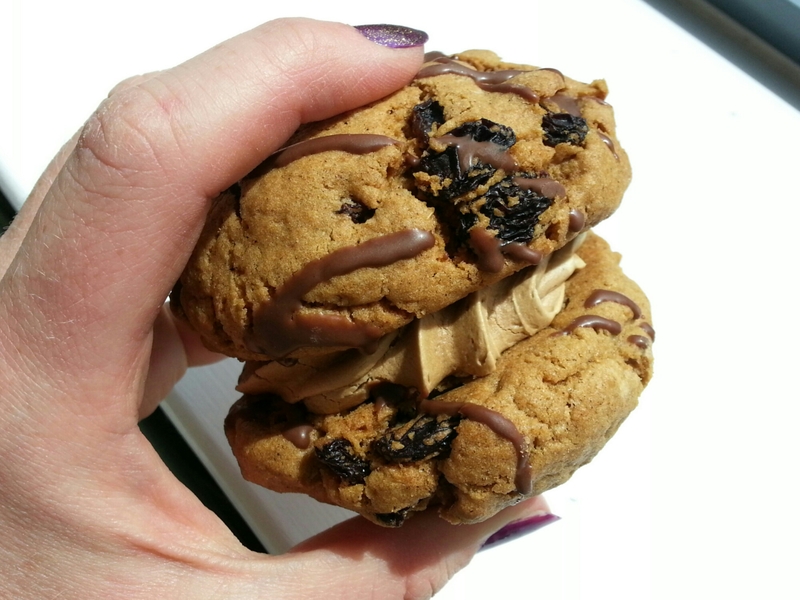 So let me take you on a tour of the treats that helped restore me to strength! 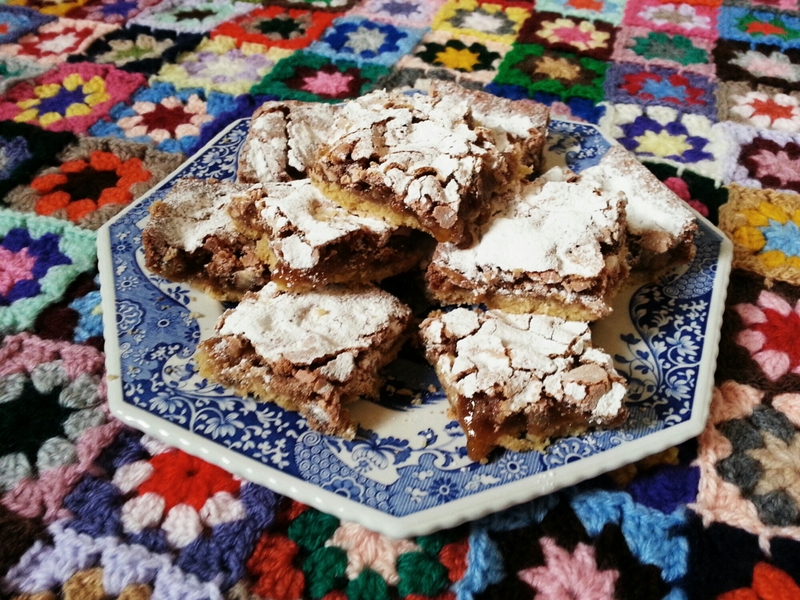 I first made this Swedish Dream Bar for my colleagues a while ago and it proved to be such a hit that it is still commented on now. Therefore I do not understand why it has taken me so long to give it another go. Moist and chewy on top with a crunchy, biscuit base this makes the perfect sweet snack with a cuppa and is easily transportable for picnics. 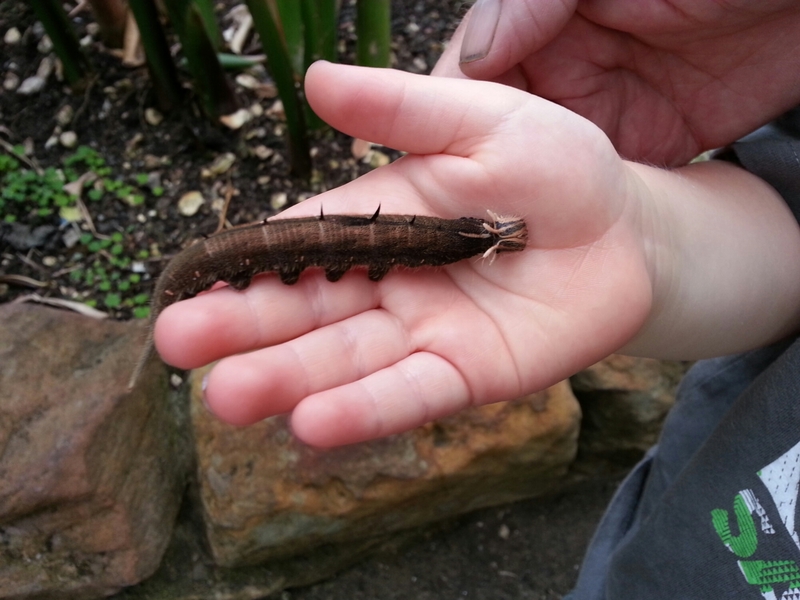 It was unfortunate timing that I caught a bug on the weekend that both my hubby and parents were away. When the craving for cake hit and I realised that the fridge was egg free I nearly cried. There was much internal cheering when I looked up one of my favourite of Lillian’s recipes, the Boiled Raisin Cake, and discovered it to be egg free. Oh happy days! (Incidentally the Chocolate Mayonnaise Cake is also egg free and definitely on my to-bake list!). This is a 1940s tea bread and I adore the simple, sweet cinnamon hit it delivers. It is also very popular with the Little Man as he is not a fan of sponge but loves fruit cakes. The final treat in this weekend bakeathon was another WWII era Cake, the Orange One Egg Cake. 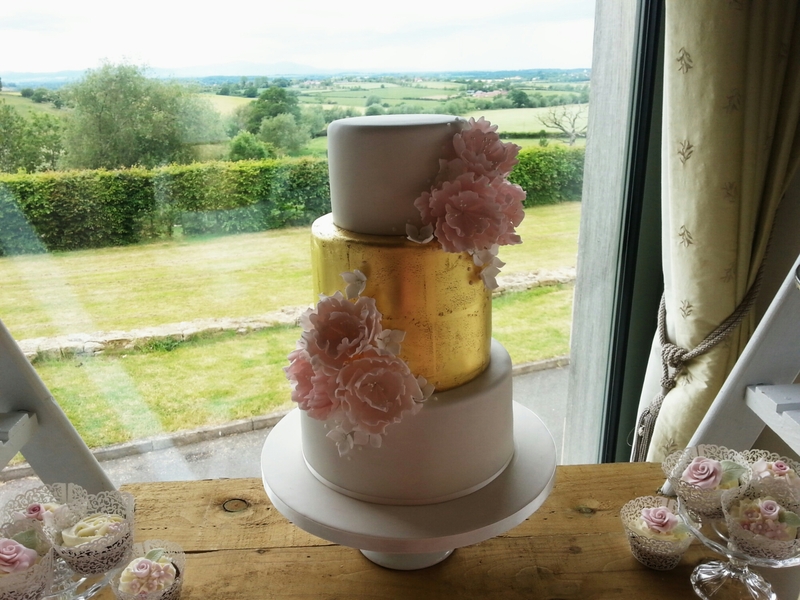 I blogged about this cake a couple years ago here but it was even better this time. I used half juice, half milk and whisked the frosting until it was extra light and fluffy. Delicious! And finally, for balance, there has been plenty of non-cake related feasting around here as barbecue season has hit. 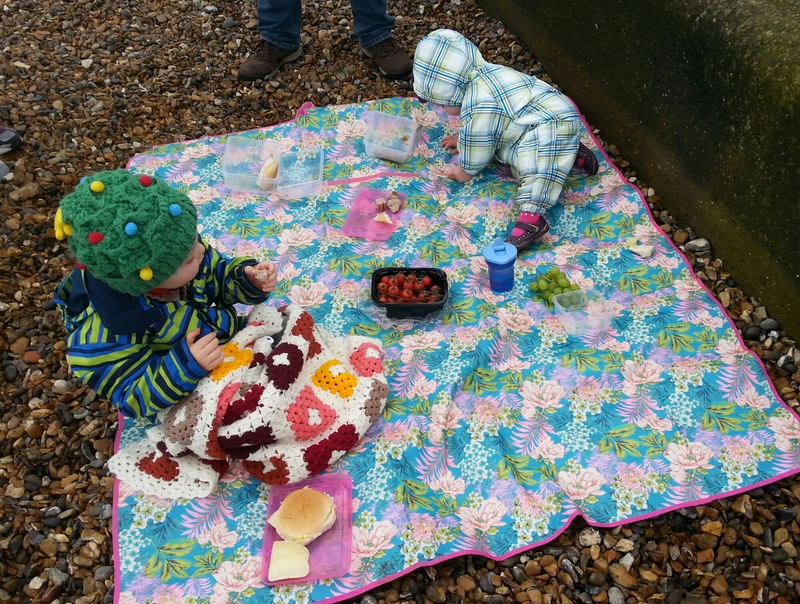 You know how much I love a picnic so you can imagine how excited I get about this sort of al-fresco dining and the Little Man thinks that they are the best thing ever! 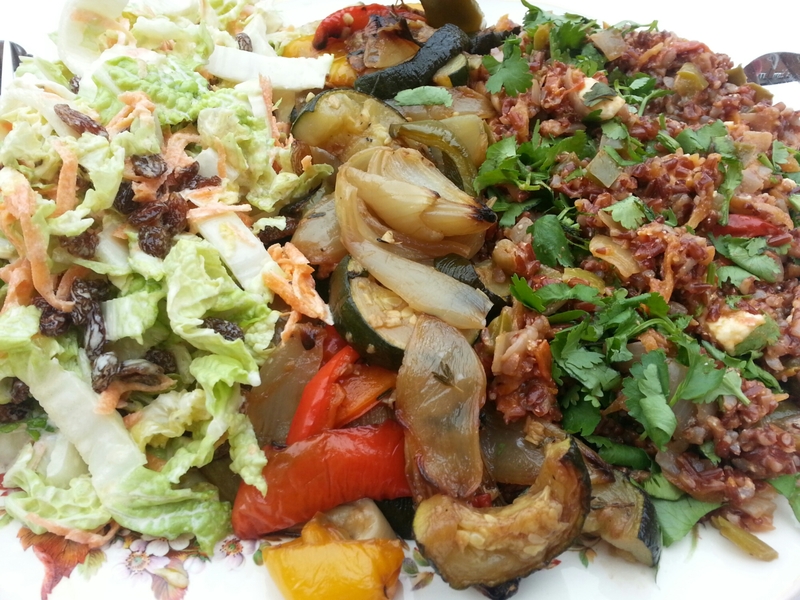 Ironically my favourite aspect of barbecues is not the meat but the salads (my husband says that this is sacrilege but hey ho). Here we have Mary Berry’s Coleslaw, made with half vinaigrette, half mayonnaise, roasted vegetables with balsalmic vinegar and, my latest obsession, Delia Smith’s Very Red Rice. 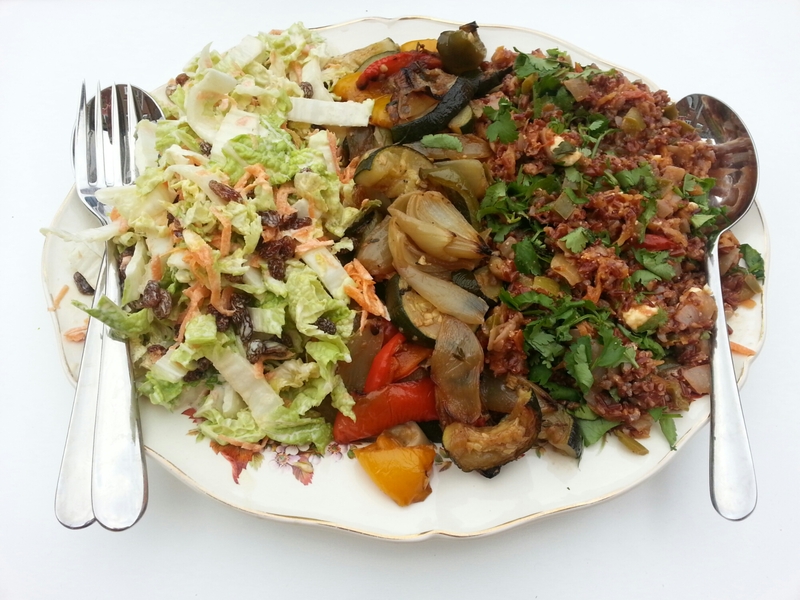 Made with Carmague red rice, this salad has a lovely nutty texture. I saw it originally on Instagram and the secret I find is to leave it to cool slightly then stir through chunks of good feta cheese and a load of coriander. So good! I shall leave you with a final, gratuitous snap of my darling Little Lady who joins in with all of this feasting with an (almost) permanent smile on her face! Hello! Remember these little beauties from the other week? They proved so popular that I have already made a second batch. Obviously I gave you the link to the superb video of the recipe but I felt that it would be much more convenient to have a written version. This is not to replace the video but will be a handy reference for when I (or anybody else!) next want to whip up another bouquet of roses. Halve and thinly slice 2 red apples and put them in a bowl of water with lemon juice. Microwave for 3 minutes then drain. Mix 3 tbsp apricot preserve with 2 tbsp water and microwave for 1 minute. Roll out 1 sheet of puff pastry into a longer, thinner rectangle and cut into 6 strips. Spread on the apricot jam. 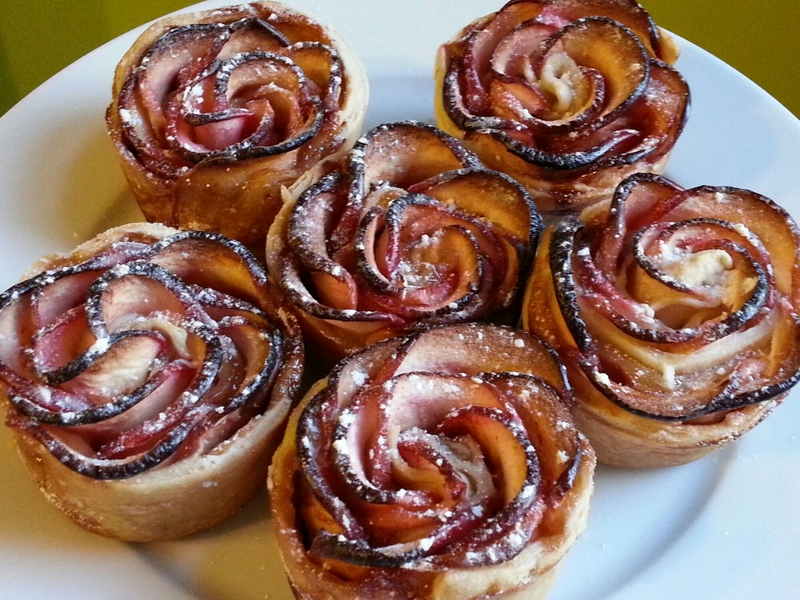 Lay the apple slices along the top of each pastry strip and sprinkle liberally with cinnamon. Fold the dough in half to hold the fruit in place (watch the video to see this process in action!). 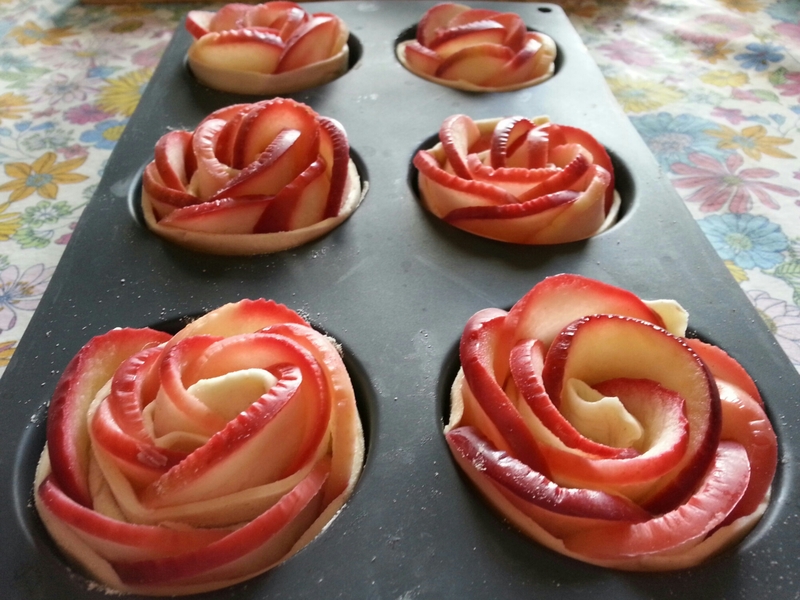 Roll up the dough strips into roses and bake in a muffin tin at 190 °C/375 °F for 45 minutes. Sprinkle with icing sugar before serving warm with a blob of ice cream. Greetings my friends. 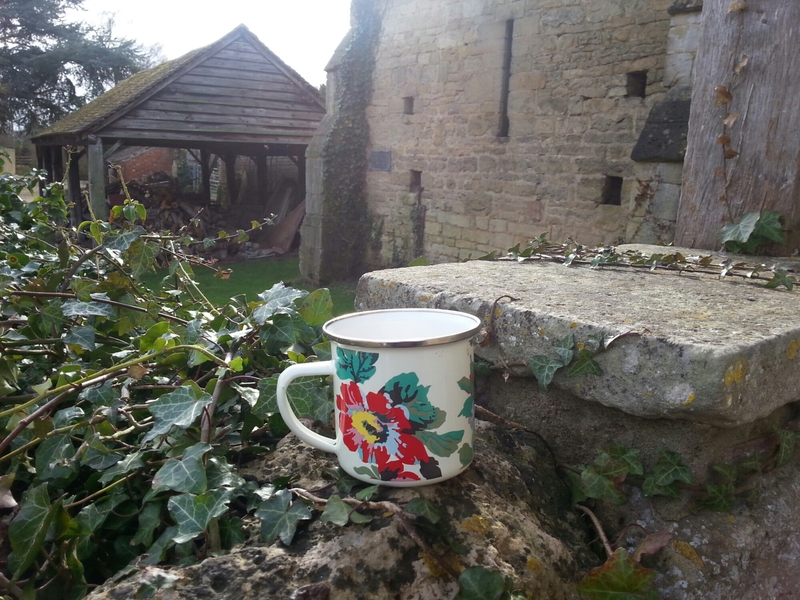 I warned you that these cups would be reappearing soon! 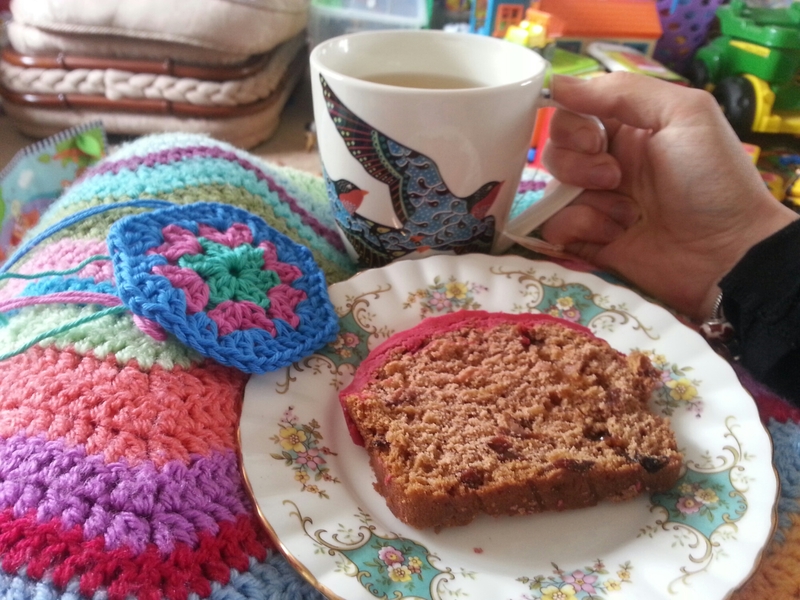 The Little Man and I have been baking so grab a ginger nut and let’s do a bit of blanket loving. 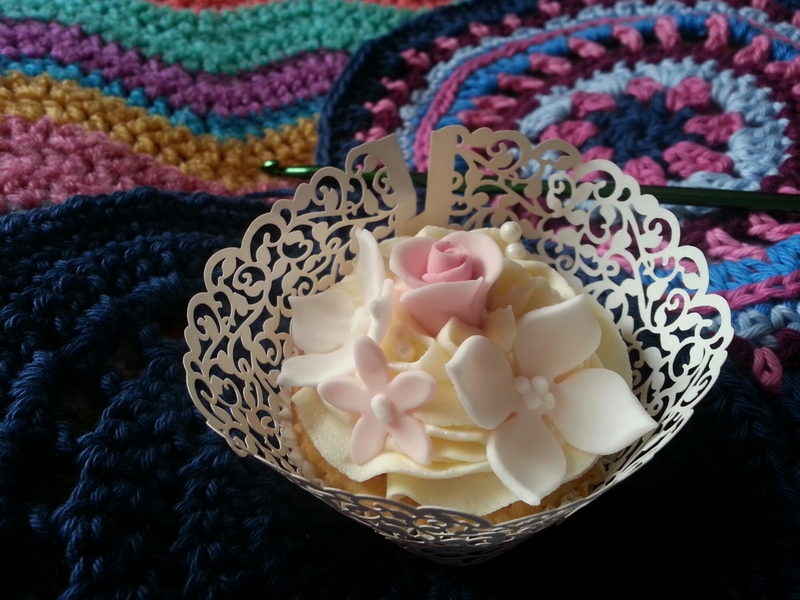 This journey started four years ago when I first picked up a hook and began learning how to crochet. 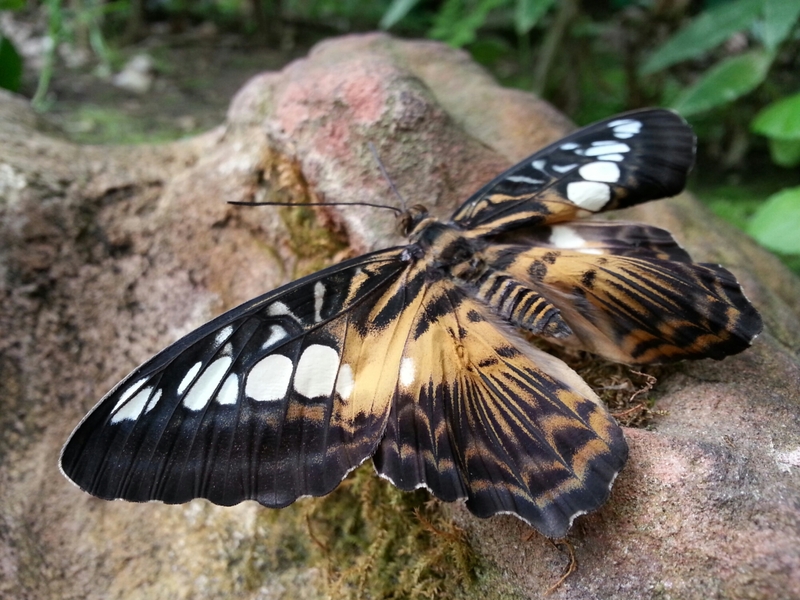 You can read the story here. 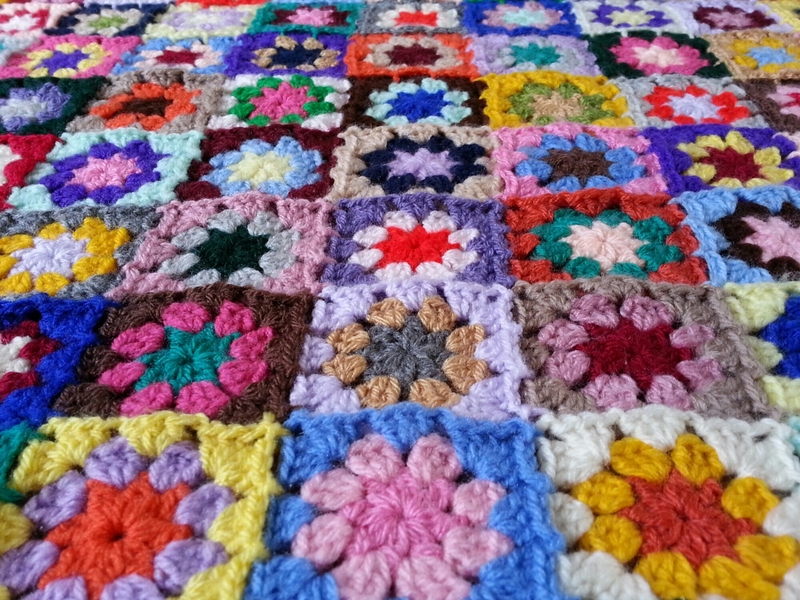 My grannies quickly became square and I was hooked (excuse the pun!). Fast forward to just before the Little Lady was born and I found my original practice granny along with the King Cole Chunky and decided to put them to good use. It wasn’t long before I had a reasonable sized square (1 m x 1 m) in these fabulously vibrant colours. 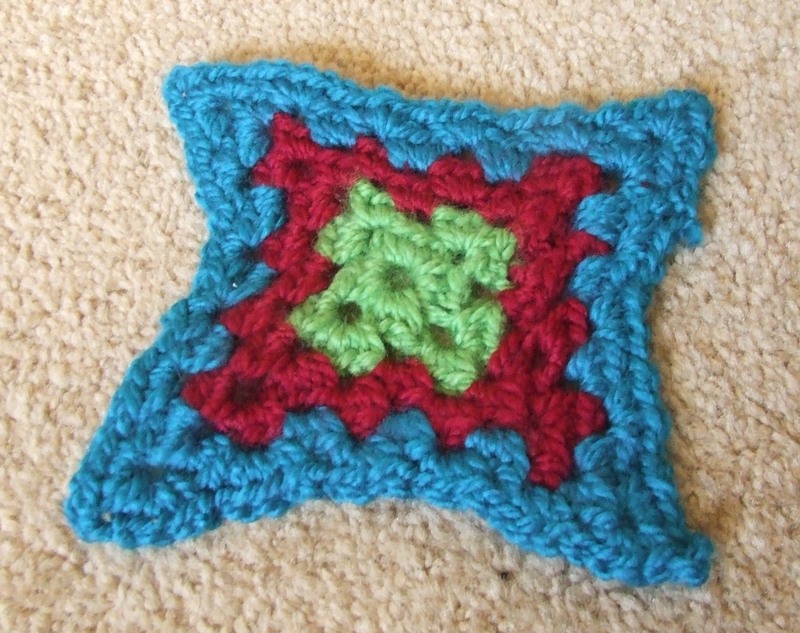 Next came the fun part – the border (#10 in Edie Eckman’s ‘Around the Corner Crochet Borders’). Made out of popcorn stitches separated by 5 chain stitches and a treble it is fun and frilly and I love the effect. There is nothing subtle about this blanket! Beware though, this edging is time consuming and eats yarn like nothing else so be prepared before embarking on a large border! Ta-dah! There we have it. 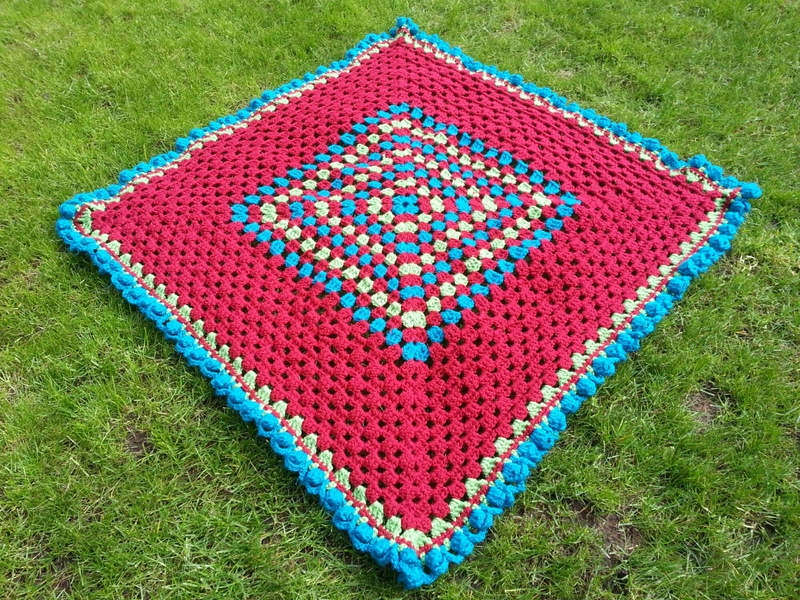 A super thick and warm baby blanket, perfect for wrapping a little one in on frosty walks. 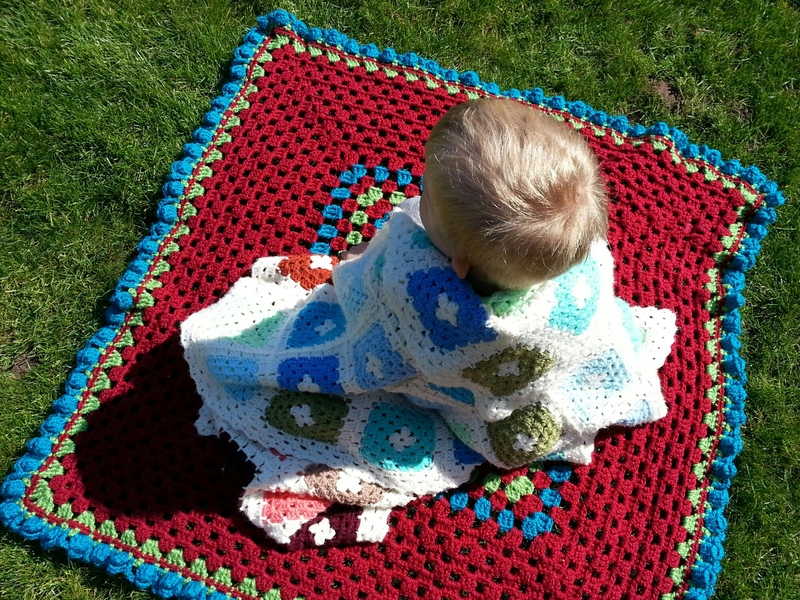 The chunky yarn gives this blanket a really tactile quality that the Little Lady really enjoys. It makes me so happy to see her pulling on those little bobbles, all warm and cosy in her woolly nest. 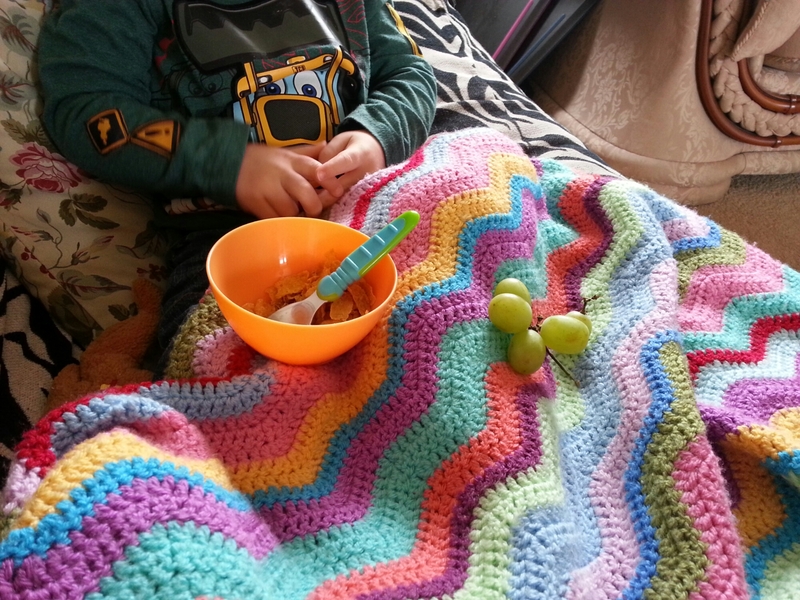 The King Cole is not as smooth as the Stylecraft feeling somewhat more ‘plasticy’, especially when wet, but blanket is soft, snuggly, rich in colour and washes well. Evening all! Can I offer you a cup of tea? 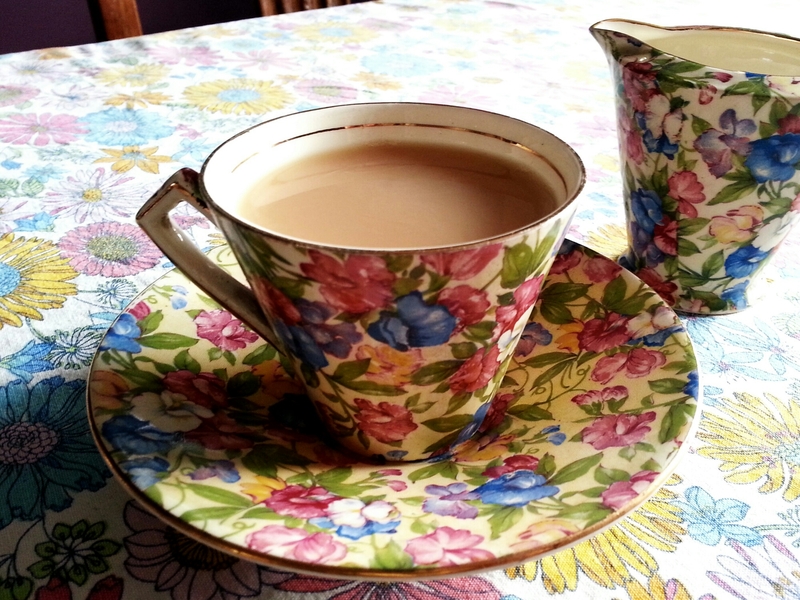 My lovely aunt came into possession of the most delightful Royal Winton tea set in Sweet Pea and very kindly gifted it to me. It is positively divine and I love every sip from it. I have a feeling that you will be seeing these pop up frequently from now on! The weather has been up and down this week. Beautiful sunshine, some much needed rain and a few grey, chilly mornings which have allowed us to wrap ourselves in the cosy blankets around the place. It makes me so happy to see them being put to good use. 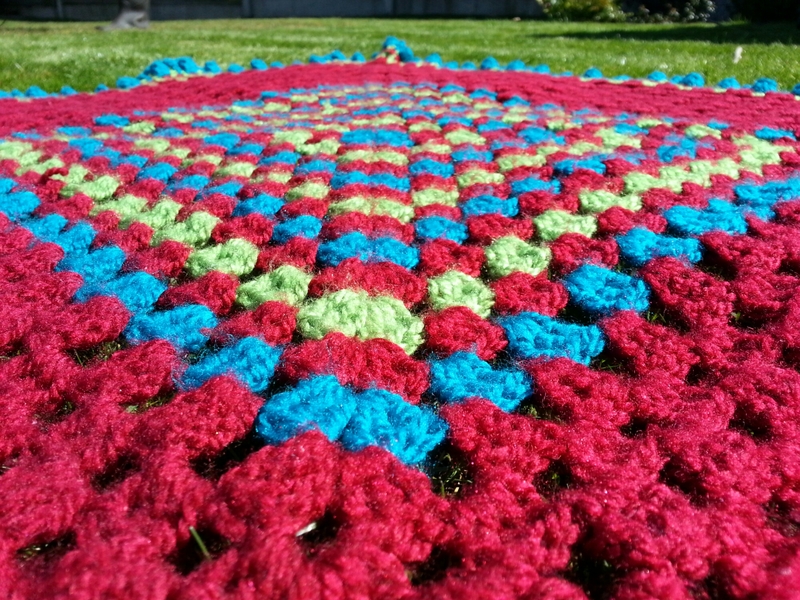 Even my Summer Garden Granny Throw was put to work as an impromptu picnic blanket. 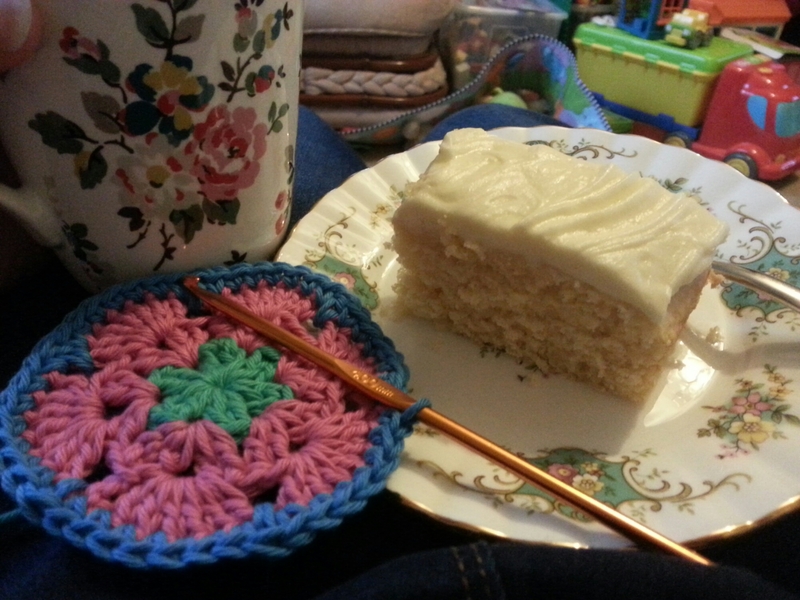 There has been a pleasing amount of crochet happening here at the moment. 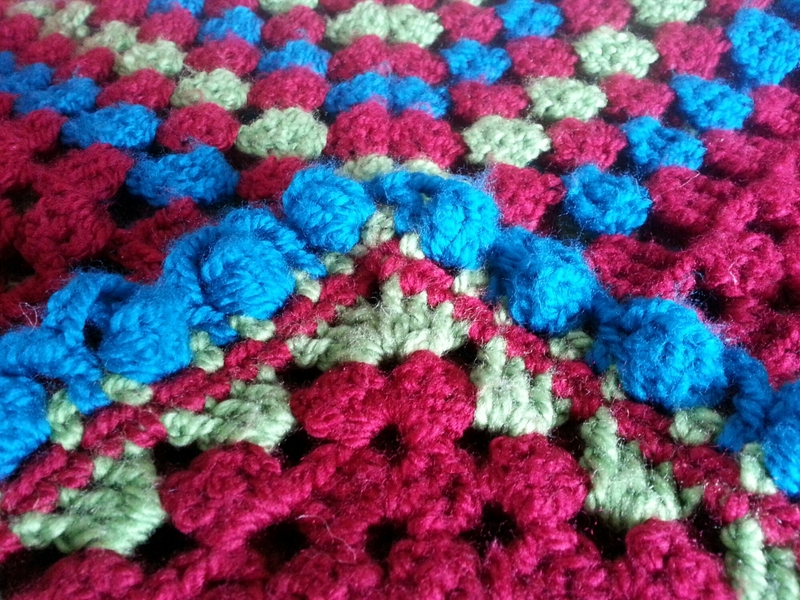 My South Bay Shawlette is coming along slowly but surely (the pattern can be found on Ravelry). The yarn is Drops Baby Alpaca Silk and is a dream to work with. Don’t you just love a bit of al fresco hooky? 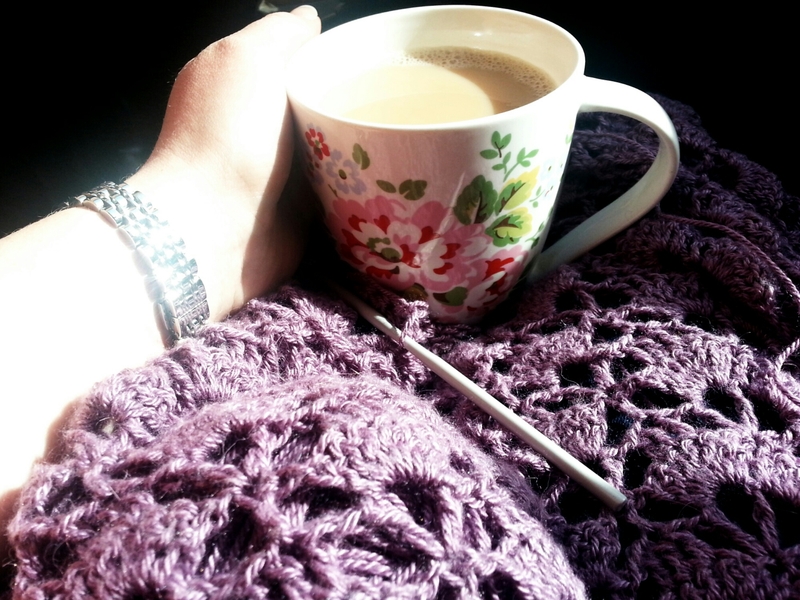 My Crochet Mood Blanket 2014 has become a 2015 mood blanket but I am loving choosing which colour it is to be each day. However the most exciting news of this week has to be from Little Lady. 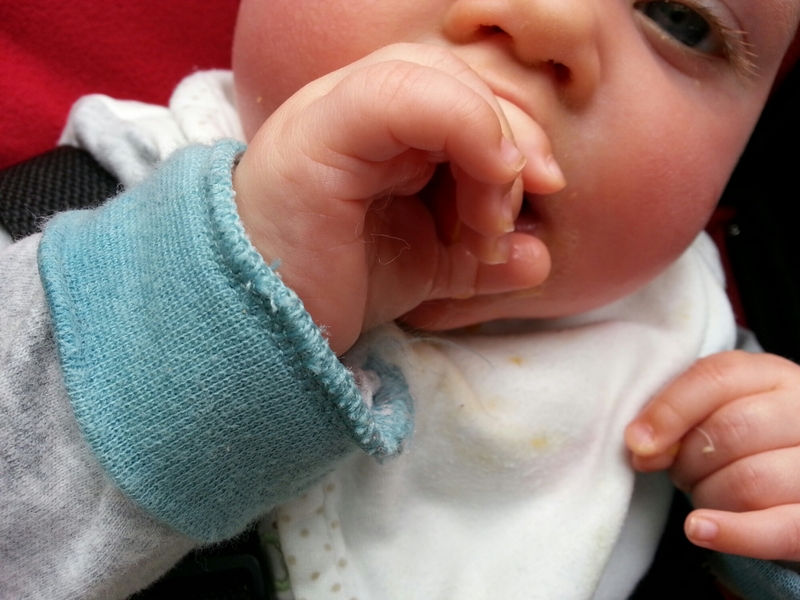 Drumroll please…my little poppet is now eating! Yes, weaning take 2 has begun. I cannot believe how well she has taken to eating. She is even giving her brother a run for his money! So far she has scoffed banana, pear, orange, potatoes in all forms, carrots, swede, brocolli, peppers, tomatoes, Weetabix, Rice Crispies, turkey with five spice and ginger, steak, chicken curry, oxtail stew, red rice with feta, cheese sandwich, crumpets and probably loads more that I am forgetting. 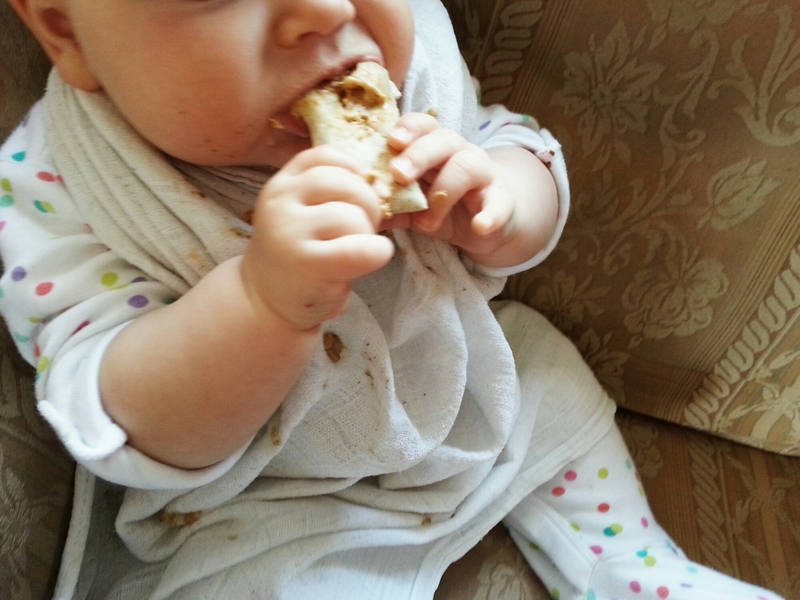 Here she is enjoying a pitta stick with cashew butter. 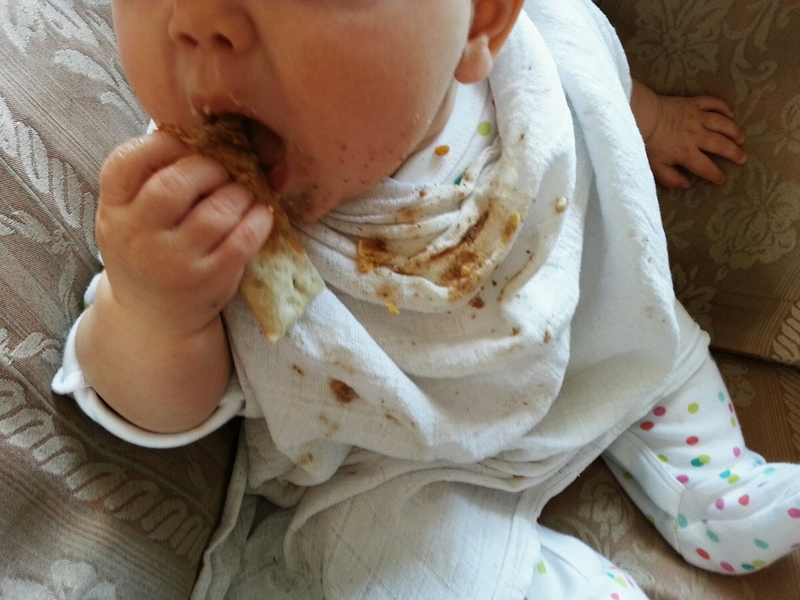 I cannot tell you how exciting I am finding this second journey into Baby Led Weaning (not least the improvement that we have seen in the length of time that she will go between feeds in the night now!). I will try to restrain myself from boring you with details of every meal time but please allow me this proud mommy moment as I leave you with one more picture. Hello my dears, I hope I find you well. Thank you for your kind wishes for the Little Lady. Her spots are now clearing and normality has returned. 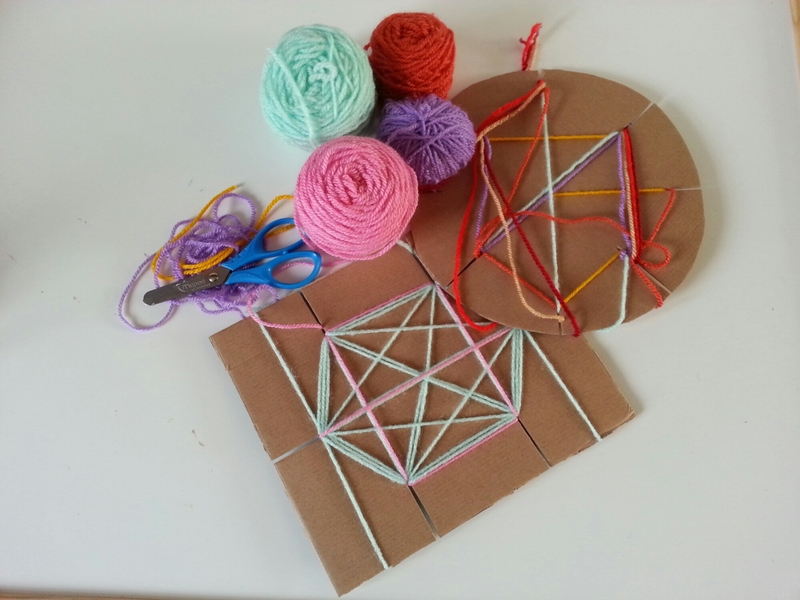 Do you like the yarn play that I enjoyed with my Little Man the other day? 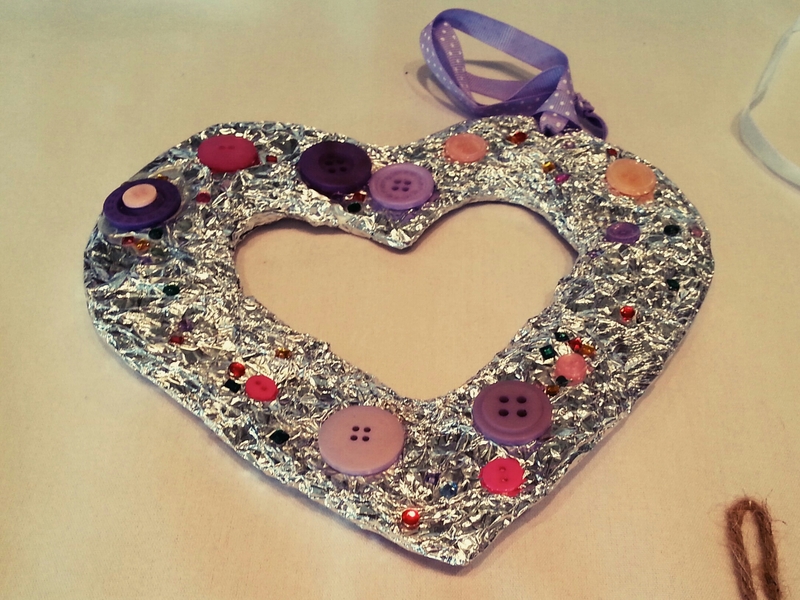 He is not the most enthusiastic artist/crafter but, with a bit of encouragement, we have some lovely sessions together. I am planning on creating a spider to live in his colourful web so it can hang in his bedroom. 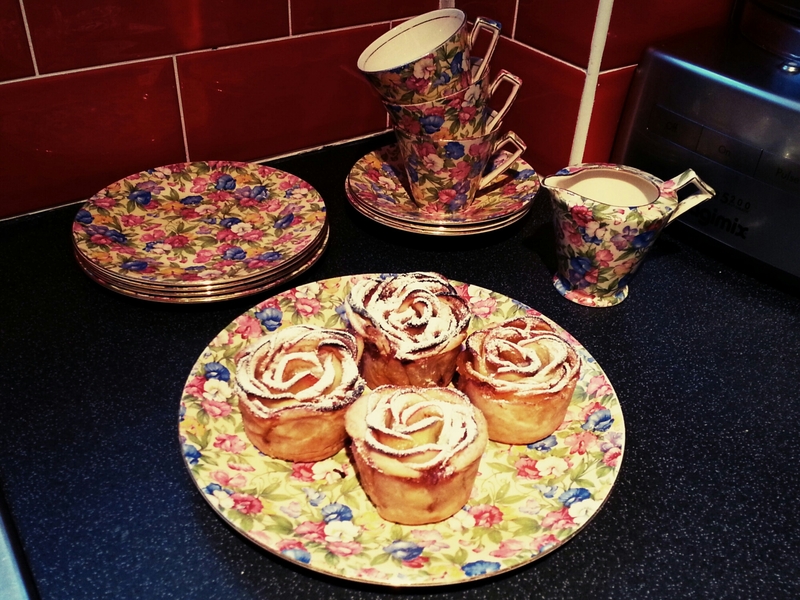 There are times when I get myself in a tizzy about this blog, planning posts, not writing them and then ending up stressing so I am hoping that this post clears a backlog. 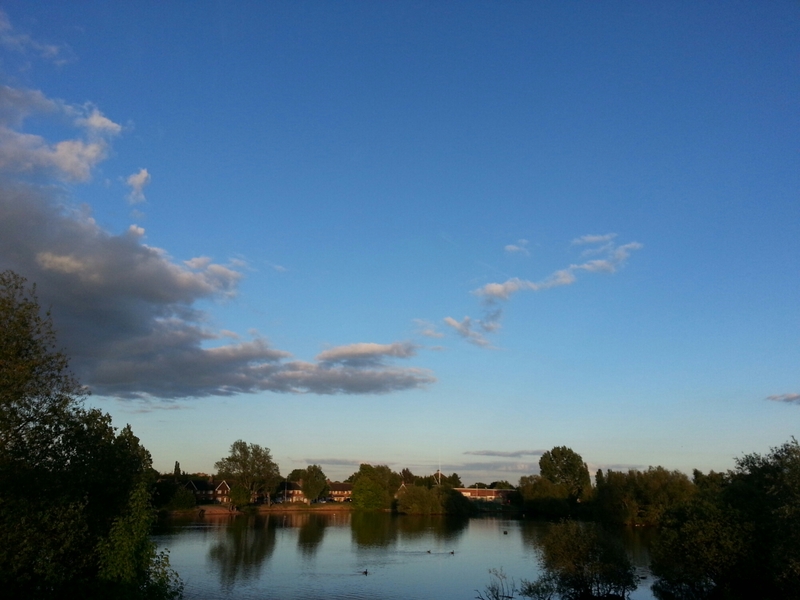 The last fortnight has been a busy mix of mundane, comfortable at home time (the in of the title) and merry outings here and there, picnicking with family and friends. Bits and pieces that make for messy posts but are a truthful reflection of everyday life. My latest obsession, Instagram, is a wonderful outlet for these moments but I still love writing my blog. If you’re on there please come and say hello @rosy_hill! 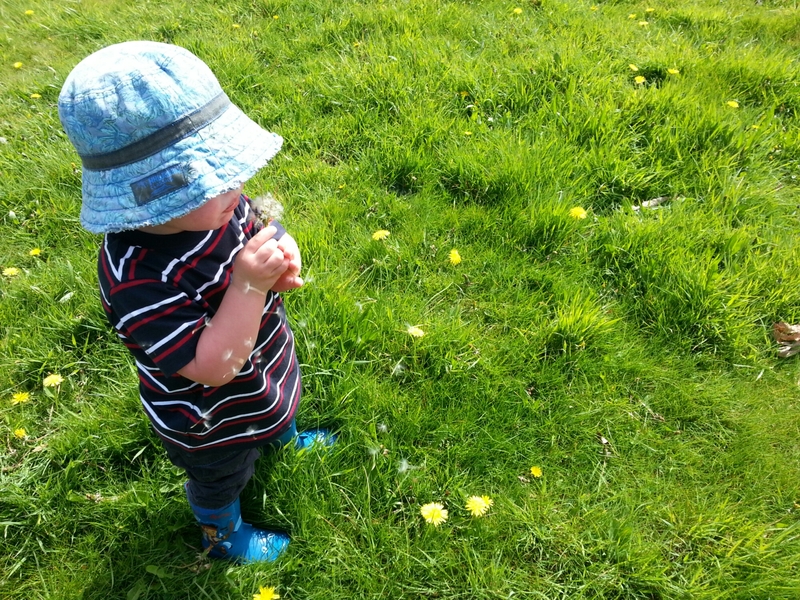 On Bank Holiday Monday we had a magical day out at one of our favourite places, Shugborough. 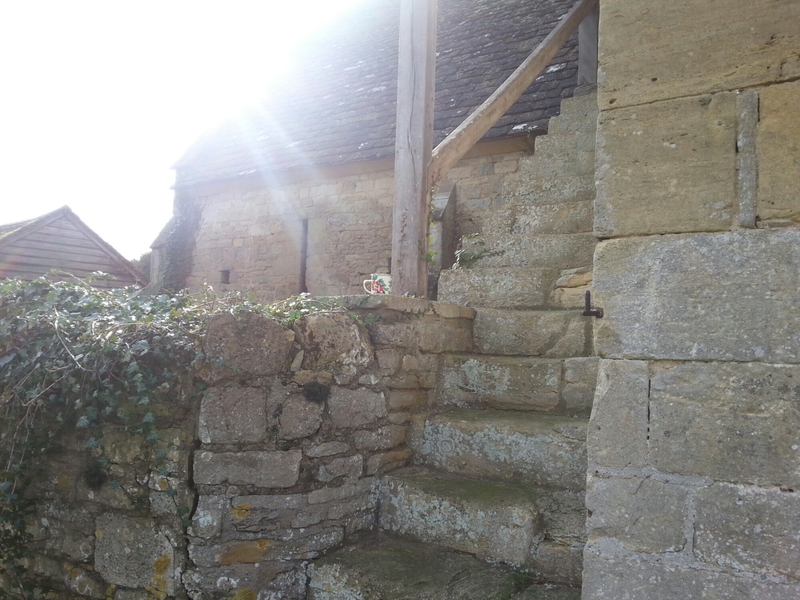 I have taken you there before here if you want to look around but on Monday it was a relaxed, family affair that centred around the little people and the picnic! It makes me so happy to see the joy my Little Man gets out of life’s simple pleasures. Chasing a ball around. 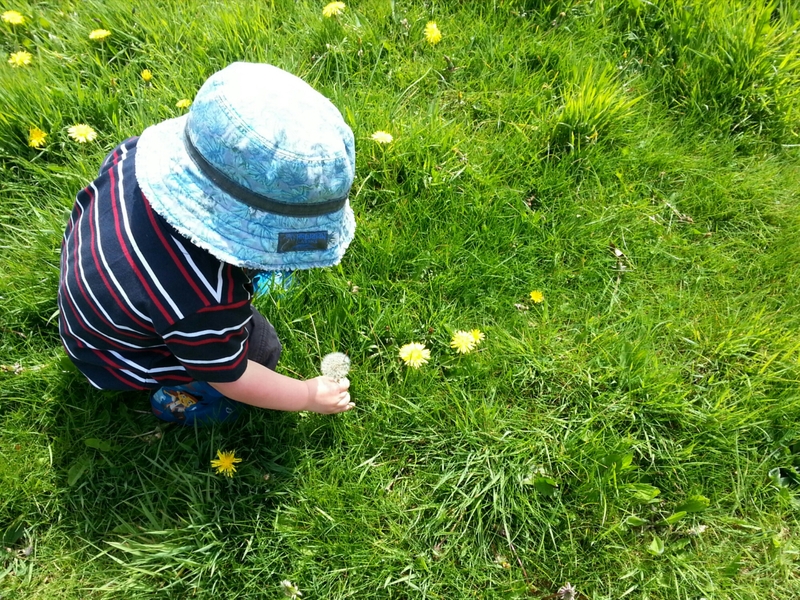 Picking dandelion clocks. 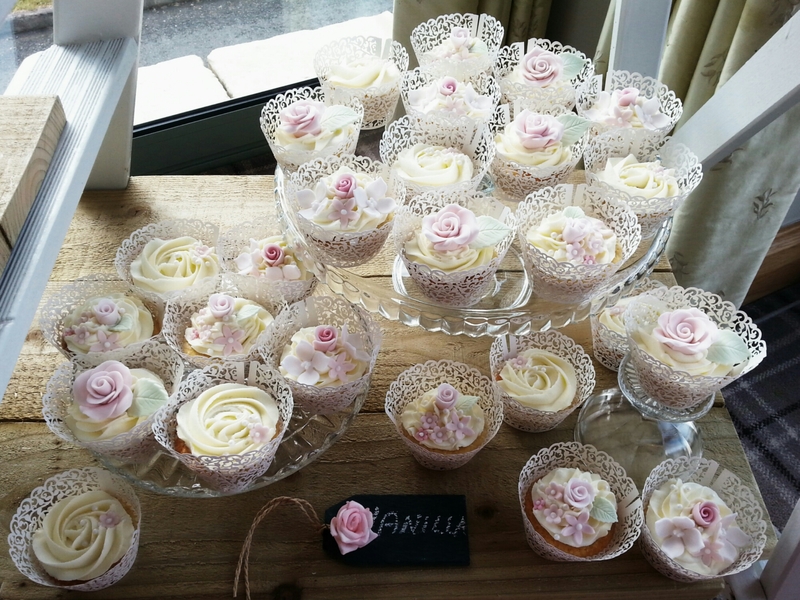 Another wonderful moment from last weekend was creating these little beauties. So simple, so effective, so delicious and so much fun! I have never used YouTube videos to cook from before but these worked out really well. Check it out here. Served warm with a blob of ice-cream they made quite a spectacular dessert! 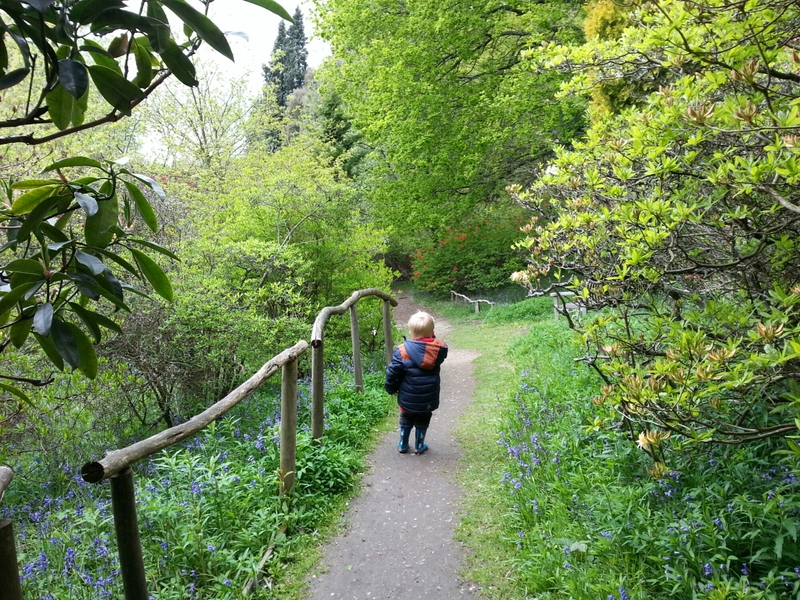 Today we are down in Kent with family and we took a trip to Riverhill Himalayan Gardens. 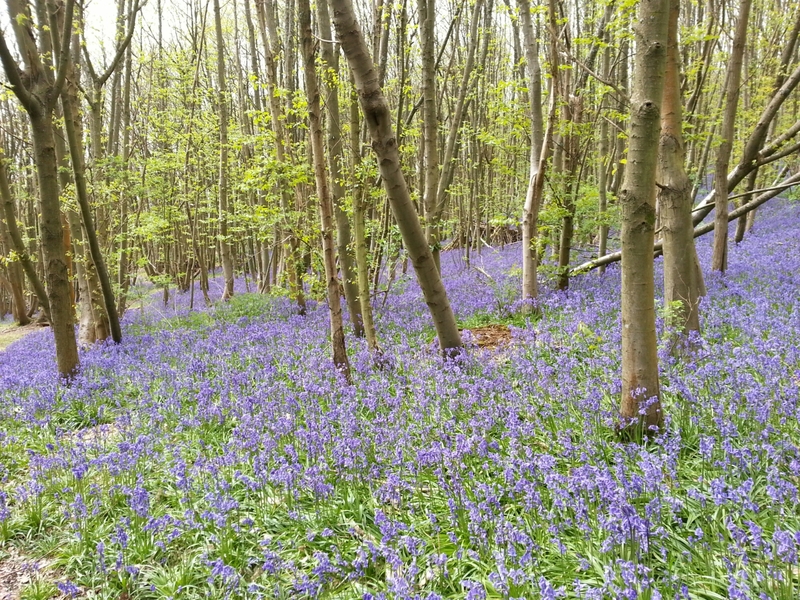 We timed the visit well with the woods being carpeted with bluebells. What a smell! The little people had a wonderful time and the weather was kind to us. It only rained a little bit and the sun even came out to say hello. 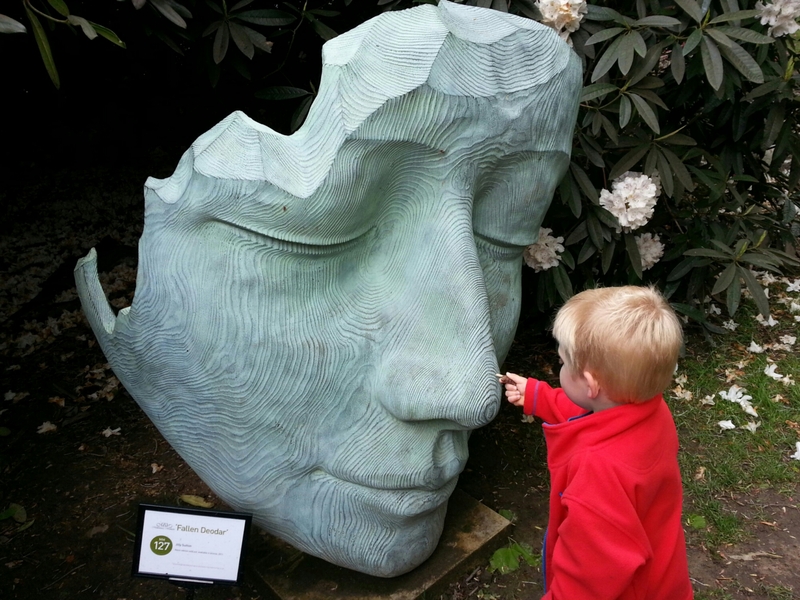 …even getting up close and personal with the sculptures! I took so many pictures of the flowers, the views, the art but mostly it was pretty overcast and they just don’t do justice to the beauty of nature. Trust me, we shall be visiting again! 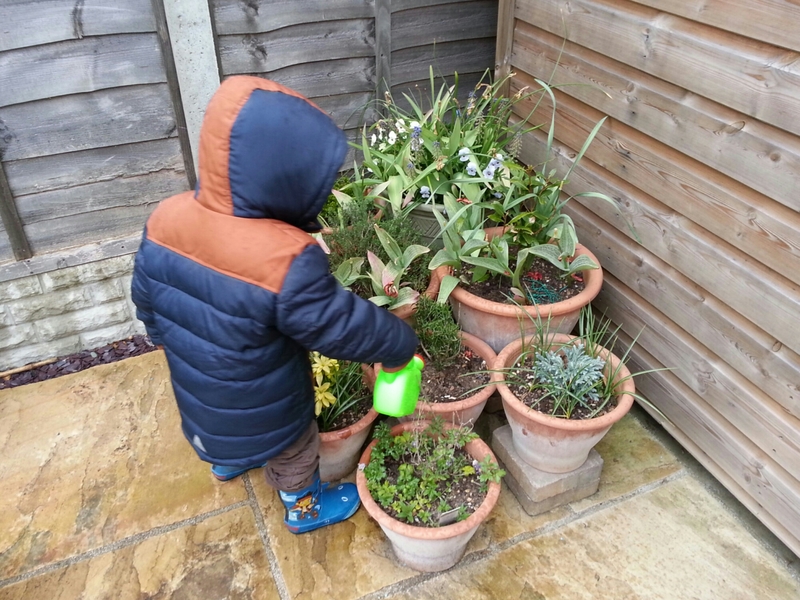 Finally, we have been busy setting up the garden for the summer. 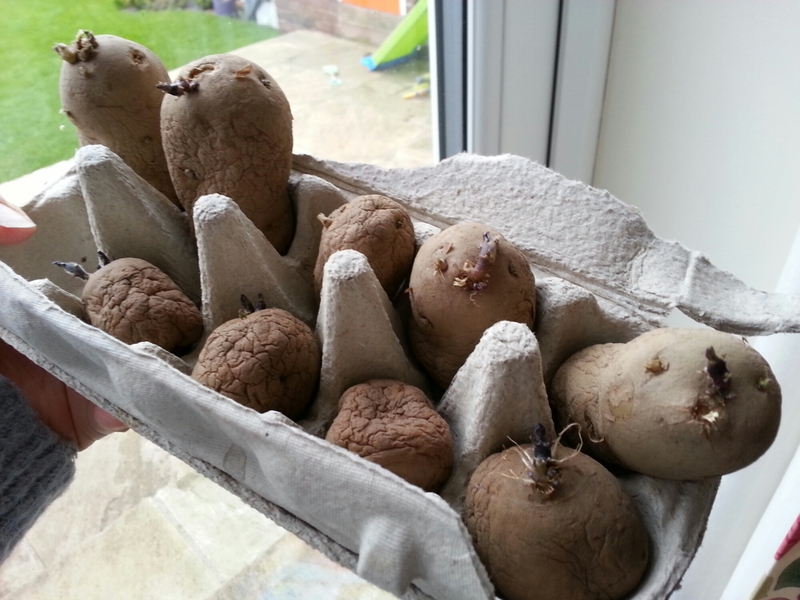 Seeds have been planted, bushes have been mulched and some dubious seed potatoes have been plunged into the ground with fingers crossed! 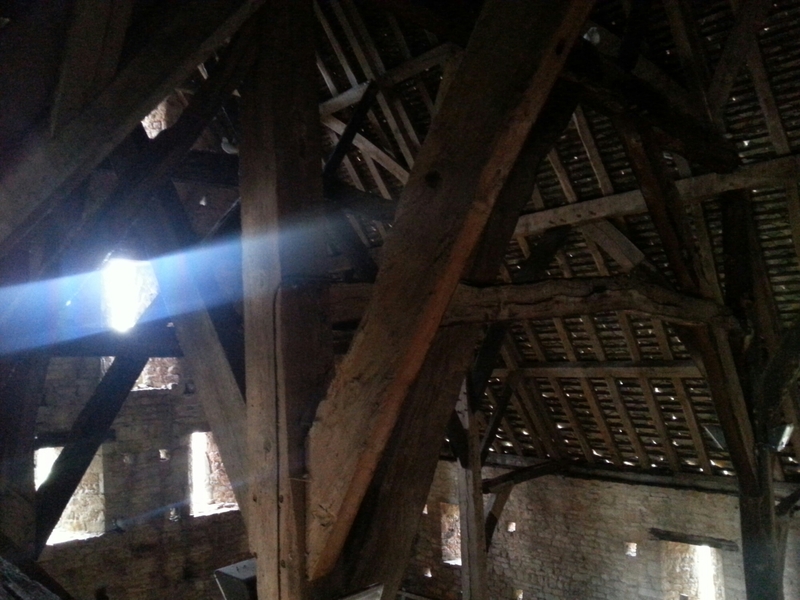 I hope to have some more to show you soon when things get going. Hello and welcome! 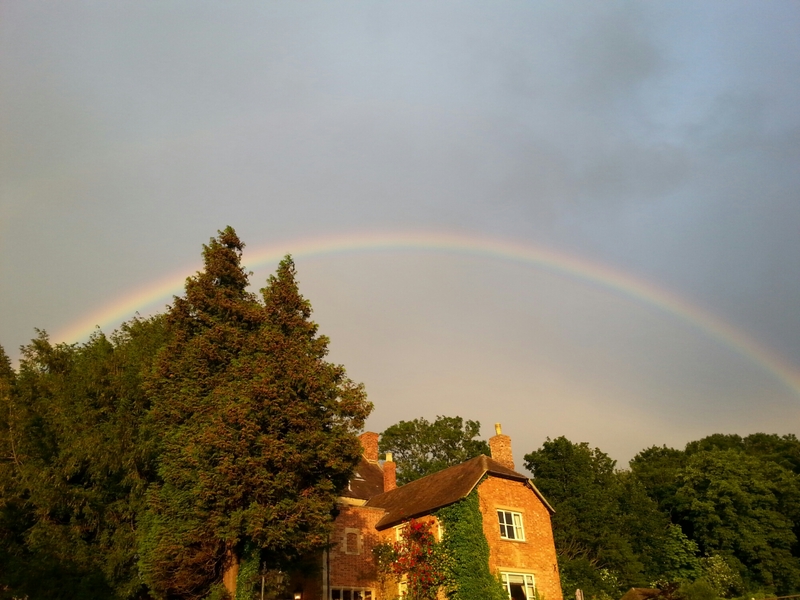 I am a primary school teacher who lives with my wonderful husband and two adorable children in a lovely, messy, comfortable house in Birmingham, England. 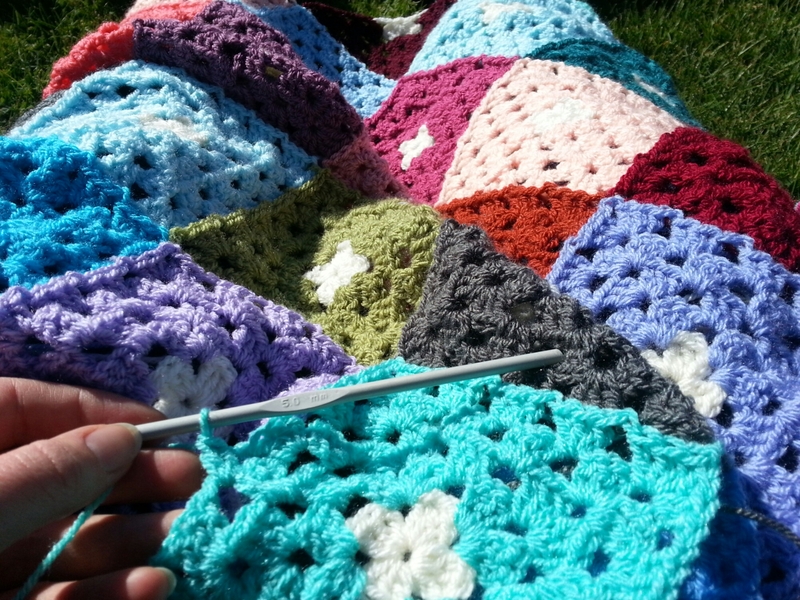 When I'm not surrounded by school books I love cooking, crocheting, gardening, reading and going on picnics with my wonderful family. 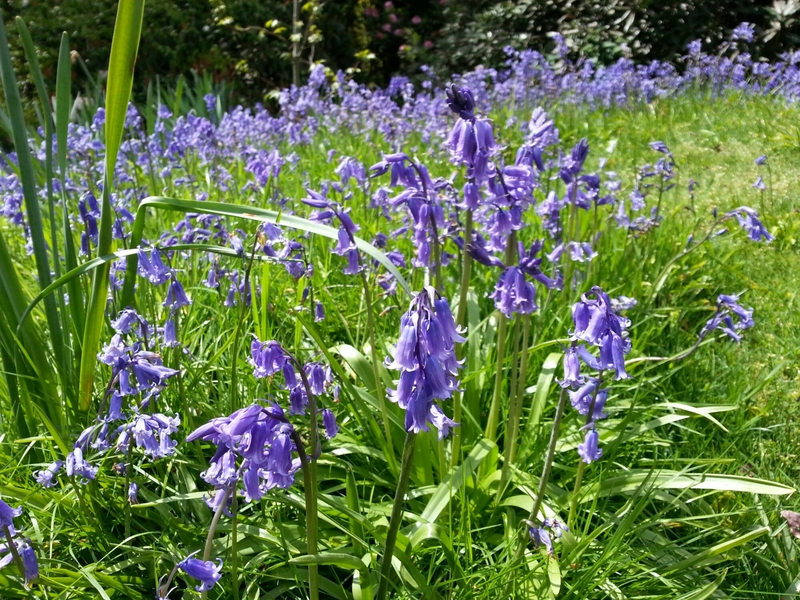 Look around Rosy Hill to find out more! Click here and we'll let you know when we post something new.